The Packer Auto Specialty Company was incorporated in Chicago in 1912 as a maker of socket sets and automotive accessories. The company took its name from Eben R. Packer, an inventor with numerous patents for automotive tools and railroad equipment. The small notice at the left was published on page 1099 of the May 9, 1912 issue of Automotive Industries and notes the founding of the company with $2500 of capital stock. The founders are listed as William Bangs, Laird Bell, and William C. Bayden. The notice at the left appeared on page 1201 of the May 23, 1912 issue of The Automobile. 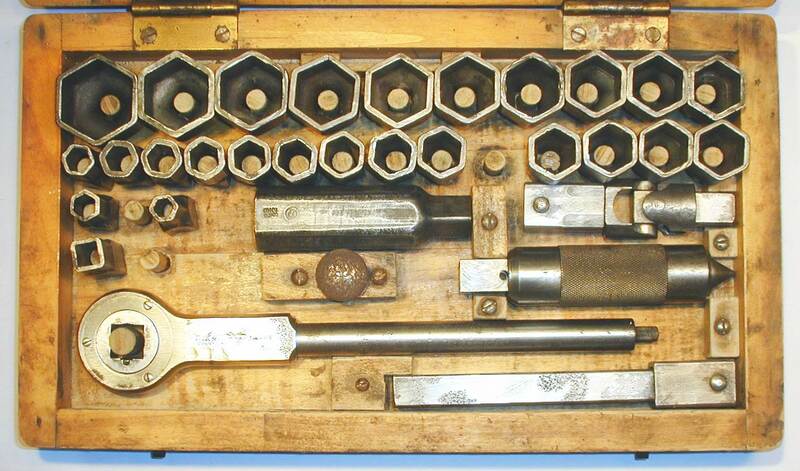 The text describes an early "Ray" socket wrench set with a barrel-type ratchet and twelve sockets, and the illustration includes details of the ratchet construction. The company address is given as the Old Colony Building in Chicago. A 1913 report from the Illinois Secretary of State listed the company's incorporation date as April 29, 1912. The notice at the left appeared on page 46 of the January 1, 1917 issue of The Horseless Age and describes a Packer Auto "Ray" socket set in a roll-up canvas carrier. Packer Auto Specialty remained in operation under this name until 1927, at which time it merged with two other companies to form a new corporation. A 1927 issue of American Exporter notes the three-way merger of Packer Auto Specialty, George H. Rives Manufacturing, and the Standard Motor Part Company to form the Auto Accessories Corporation of America. The notice offered copies of the new company's catalog listing their combined products, including "Ray" brand socket wrenches. Packer Auto sold its products under the "Ray" trademark. This trademark was issued on May 11, 1920 as #131,359; however, for some reason the document is not available from the USPTO. The trademark logo can be seen at the left, as published on page 671 of the February 24, 1920 edition of the Patent Gazette. The application was filed on November 8, 1919, and the first use date is listed as May 1, 1913. Fig. 176. Ray 654 (1/2x5/8)x5/8 Triple Socket Wrench, with Insets for Side View and Marking Detail. Fig. 176 shows a Ray (1/2x5/8)x5/8 triple socket wrench, stamped with "Ray" and the fractional sizes on the shank. The overall length is 10.3 inches, and the finish is plain steel, with extensive pitting due to rust. The Page-Storms Drop Forge Company was founded in 1902 by Edward C. Page and Frank F. Storms, with operations in Chicopee, Massachusetts. The company operated primarily as a merchant drop forger, but also produced a line of open-end and pipe wrenches. In 1919 Page-Storms was acquired by the Moore Drop Forging Company of nearby Springfield, Massachusetts. The illustration at the left shows an advertisement for Page-Storms Drop Forge from the October 1919 issue of The American Drop Forger. Fig. 177. Page-Storms 3/4x13/16 Open-End Wrench, with Inset for Reverse Detail. Fig. 177 shows a Page-Storms 3/4x13/16 open-end wrench made for Crompton & Knowles, stamped "Crompton & Knowles Loom Works" on the shank, with the PS-Oval logo on the reverse face. Fig. 178. Page-Storms 7/16x1/2 Toolpost Wrench, with Inset for Reverse. Fig. 178 shows a Page-Storms 7/16x1/2 toolpost wrench made for Crompton & Knowles, stamped "Crompton & Knowles Loom Works" on the shank, with the PS-Oval logo on the reverse face. The overall length is 5.8 inches, and the finish is plain steel. The Palmer Brothers Company operated in Meadville, Pennsylvania and is currently known only for their "Welloct" brand of pliers of patented construction. Fig. 179. Palmer Brothers "Welloct" No. 207 Slip-Joint Pliers, with Insets for Side View and Marking Detail. Fig. 179 shows a pair of "Welloct" No. 207 slip-joint pliers, stamped "U.S. Pat. 2152563" near the pivot joint, with "Palmer Brothers" and "Meadville, PA." on the reverse. 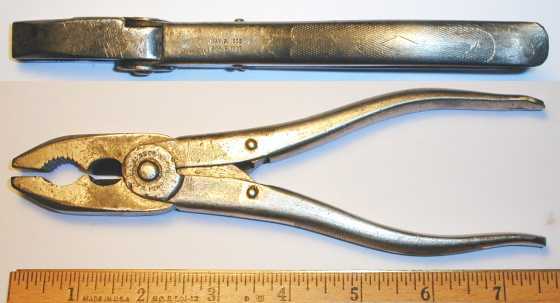 The top inset shows a side view of the pliers, with the dimple-like pattern on the handles somewhat similar to the well-known "Vacuum Grip" pattern. The patent notice refers to patent #2,152,563, issued to Robert W. Palmer and John P. Palmer in 1939. 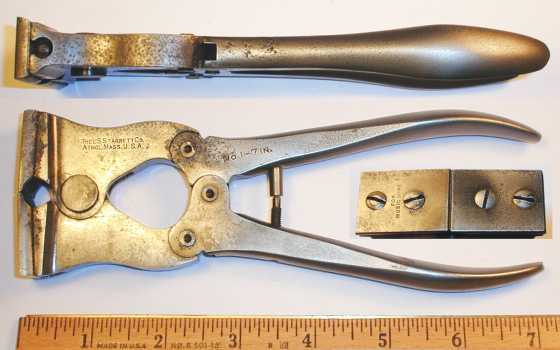 The patent describes pliers made with a forged tab on one handle operating in a slot in the other handle, effectively providing a slip-joint function without using a special bolt. Park Metalware was a small tool maker operating in Orchard Park, New York. 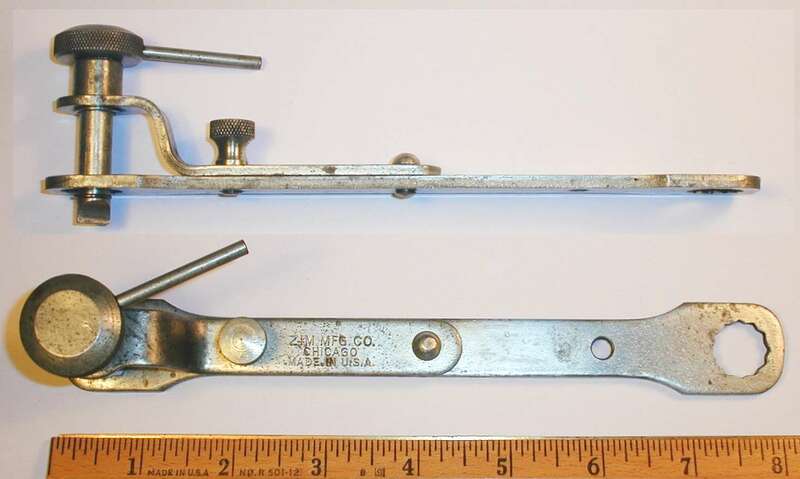 During the 1920s the company developed and patented a line of interchangeable open-end wrenches, and produced other tools including the adjustable drain-plug wrench shown below. Park sold its tools under the XCEL brand, and later used the brand name Xcelite for a line of screwdrivers and nut drivers. The Xcelite brand continues today as part of the Cooper Tools conglomerate. Fig. 180. 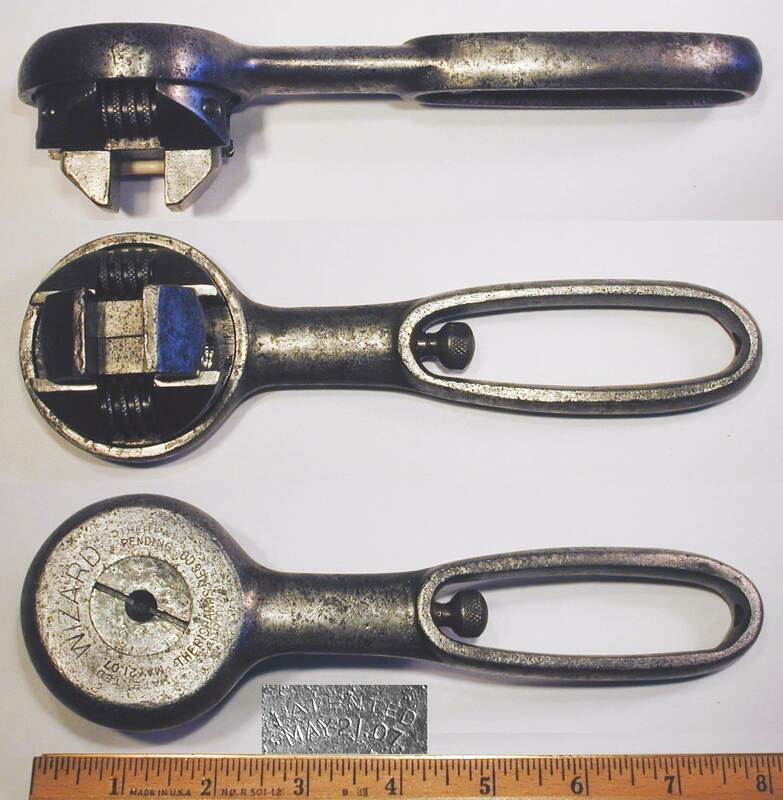 Park Metalware Adjustable Drain-Plug Wrench, with Inset for Side View, ca. Late 1920s to 1930s. Fig. 180 shows a Park adjustable socket wrench for drain-plug service, marked "Park Metalware Co." and "Orchard Park, N.Y. U.S.A." on the rotating handle, though the markings are very faint due to wear and rust. The overall length (when retracted) is 7.8 inches, and the finish is plain steel. Although not marked on this example, this wrench design is covered by patent #1,639,831, issued to J. Zilliox in 1927. Readers familiar with our Blackhawk article will undoubtedly recognize the similarities between this tool and the Blackhawk 151 "Adjusto" Wrench shown in that article. The Park tool preceded the Blackhawk model by some number of years, and clearly must have influenced the Blackhawk design. The Peerless Wrench Company was founded in 1919 and operated in Providence, Rhode Island. Based on a published report by the Rhode Island Secretary of State, the founders were Anthony M. Cunha, Florence E. Allen, and William D. Whipple, and the company's certificate of incorporation was issued on July 21, 1919. The stated business activities were manufacturing, buying, and selling of wrenches, tools, and other metal products. Aside from the incorporation notice, we haven't been able to find many published references to Peerless Wrench, suggesting that the company probably had a relatively short life. The company's most notable product was a distinctive rotating-head ratchet, for which Anthony M. Cunha had received patent #1,307,485 in 1919. In addition to the rotating head, the ratchet also incorporated an advanced progressive-engagement pawl mechanism. This innovative design was an milestone in the development of ratchets, and influenced later (and better known) models such as the OTC H-160 Flex Ratchet and S-K Roto-Ratchet. A catalog listing for the Peerless ratchet appears on page 362 of the Waterhouse & Lester catalog No. 20 for 1924. It was available in two versions, a fixed head for $2.75, and a universal (rotating) head for $3.75. 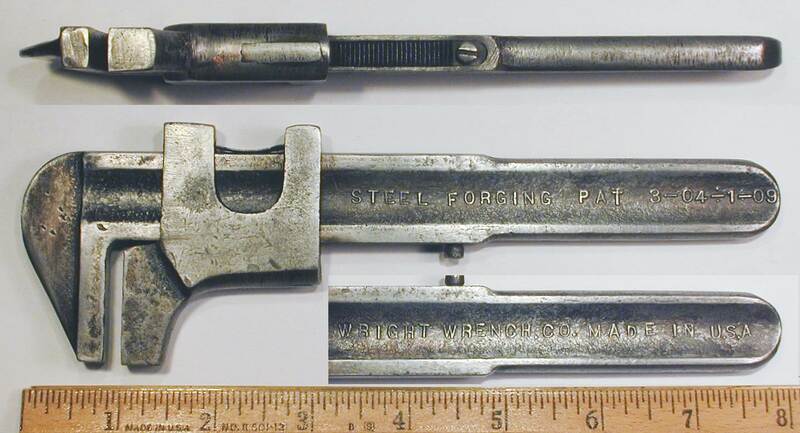 In the late 1920s the Apco-Mossberg company offered its own version of the Peerless ratchet as a Ford connecting rod wrench. The Apco-Mossberg version of the ratchet has "APCO" instead of "Peerless" forged into the handle. Fig. 181. "Peerless" 1/2-Hex Drive Cunha Patent Ratchet, with Insets for Side View and Reverse Detail, ca. 1920s. Fig. 181 shows a 1/2-hex drive Peerless Wrench rotating-head ratchet of the Cunha patented design, marked with the patent notice "Pat'd June 24, 1919 March 1, 1921" forged into the shank. The rotating head is fitted with a hex drive stud that can be pushed through to reverse the operation. The overall length is 8.3 inches, and the finish is polished steel. The first patent date refers to patent #1,307,485, filed by A.M. Cunha in 1918 and issued in 1919. The second date refers to patent #1,370,194, filed by A.M. Cunha in 1919 and issued in 1921. This later patent described a removable accessory handle that could be added to the base ratchet to form a Tee handle. This ratchet was acquired as part of a "Service" socket set in a metal case, but this tool was the only marked piece in the set. The generic markings of the set suggest that it was made as contract production for another company, possibly a large retail operation. Fig. 182. APCO Cunha Patent 1/2-Hex Drive Ratchet, with Insets for Side View and Reverse Detail, ca. Late 1920s. Fig. 182 shows the APCO version of the Cunha patent rotating-head ratchet, marked with "APCO" forged into the shank, with "Pat'd June 24, 1919 March 1, 1921" forged into the reverse. The overall length is 8.3 inches, and the finish is plain steel, with extensive pitting due to rust. The Place Manufacturing Company was founded in 1889 by Chauncey C. Place and operated in Oswego, New York as a maker of lathe chucks, pipe wrenches, and other tools. One of the tools produced by Place Manufacturing was a pipe wrench based on patent #391,957, issued in 1888 to J.A. Giles. Fig. 183. Place Mfg. 10 Inch Giles Patent Pipe Wrench, with Insets for Side View and Reverse Detail, ca. 1889 to 1890s. Fig. 183 shows a Place Mfg. 10 inch pipe wrench, marked with "The Place M'f'g Co." and "Oswego, N.Y." forged into the shank, with "Giles Patent" and "Oct. 30 '88." forged into the reverse. The patent date refers to patent #391,957, filed by J.A. Giles in 1888 and issued later that year, with partial assignment to C.C. Place. A 1909 edition of the Motor Cyclopedia listed the company as a maker of socket wrenches with an address at 184 Summer Street, Boston, and with J. Frank Torbert as the company president. A 1909 report from the Massachusetts Tax Commissioner gives December 11, 1907 as the certification date for the corporation. The Rex Wrench tools were based on patent #820,185, filed by J.W. Edmands in 1904 and issued on May 8, 1906. The patent document clearly illustrates the operation of a Tee handle with insertable socket heads, with the connection to the handle allowing several angular offsets. The Rex Wrench Company had only a relatively short life, as the corporation was dissolved in 1916, according to a 1916 report of Special Acts by the General Court of Massachusetts. The advertisement at the left was published on page 262 of the June 1, 1909 issue of the Cycle and Automobile Trade Journal. The illustration shows their "Rex T Adjustable Socket Wrench Set" on top, with a set of open-end wrenches partially visible on the bottom. The text notes that the tools are drop forged from carbon steel. Another advertisement for Rex Wrench sets can be seen at the left, with this one published on page 23 of the July 9, 1909 issue of The Horseless Age. 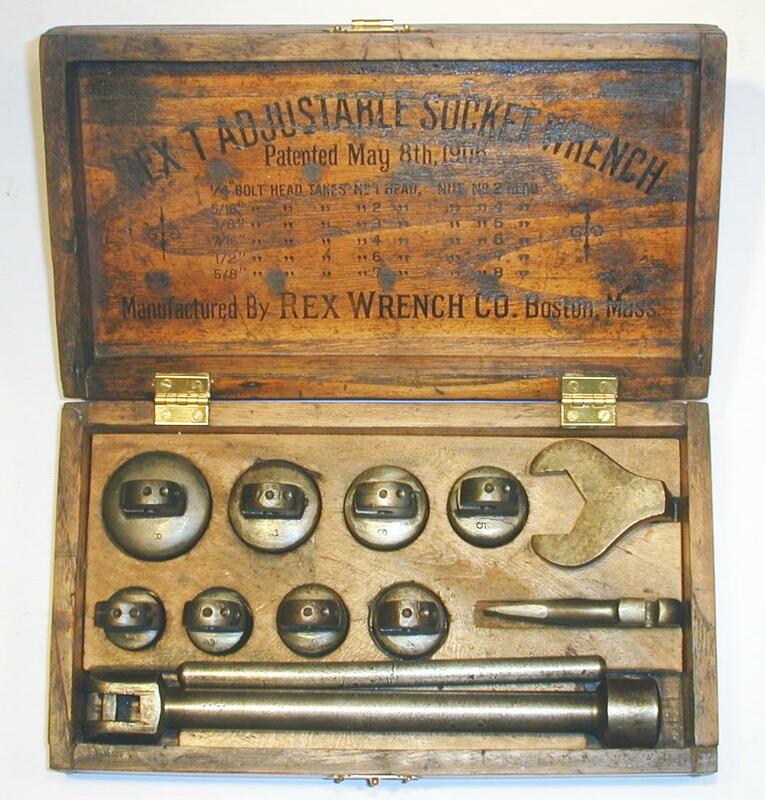 The text describes the Rex Wrench set and illustrates a set with open-end wrench heads. The wrench heads (or other attachments) all have an integral hook-shaped drive tang which fits into a special Tee handle. Fig. 184. Rex Wrench "T" Adjustable Socket Wrench Set, ca. 1907-1916. Fig. 184 shows a Rex Wrench "T" socket wrench set, consisting of a Tee handle, crossbar, eight hex socket heads, an open-end wrench head, and a screwdriver head. The inside of the lid is marked "Rex T Adjustable Socket Wrench Set" in a curved arc, with "Patented May 8th, 1906" just below, and with "Made by Rex Wrench Co." and "Boston, Mass." at the bottom. The patent date refers to patent #820,185, filed by J.W. Edmands 1904 and issued in 1906. Fig. 185. Rex Wrench Tee Handle from "T" Adjustable Set, with Insets for Construction and Marking Detail, ca. 1907-1916. Fig. 185 shows the Rex Wrench Tee handle from the "T" adjustable set, stamped with a "Pat'd. May 6, '06" patent date on the reverse. The upper inset shows the construction of the drive head. The cross-bar serves to retain the socket or wrench head in the drive end, and the spring-loaded plunger holds the head in the desired position. The Richards Manufacturing Company was founded in Aurora, Illinois and was in operation by 1904 or earlier. The company's earliest products included ball-bearing door hangers and foot-powered grindstones, but their best known product was probably the "Wizard" adjustable ratchet wrench, which was in production by 1908. In 1910 Richards Manufacturing merged with the Wilcox Manufacturing Company to form the Richards-Wilcox Manufacturing Company. The combined companies produced several types of wrenches in addition to the "Wizard" wrench, including a "Shark" adjustable pipe wrench, a "Yankee" monkey wrench, and various farm implement wrenches. Interestingly, Richards-Wilcox remains in business today as a maker of overhead conveyor systems and door hardware, and readers can visit their web site at Richards-Wilcox [External Link] for more information. The advertisement at the left appeared on page 10 of the January 1909 issue of The American Blacksmith and shows an illustration of the Wizard wrench. A separate notice in the same publication describes the advantages of the wrench and claims that several thousand wrenches had been sold by that time. Fig. 186. Richards "Wizard" Adjustable Ratchet Wrench, with Insets for Reverse and Side Views, ca. 1908-1910. Fig. 186 shows a Richards "Wizard" adjustable ratchet wrench, stamped with "The Richards Mfg. Co." and "Aurora, Ill." on the face, with "Patented May 21, '07" and "Other Pats Pending" patent notices. The overall length is 7.8 inches, and the finish is plain steel. The patent date refers to patent #854,174, filed by J.N. Noyer in 1906 and issued 1907. The Ridge Tool Company is best known as the maker of Ridgid brand pipe wrenches. Ridgid pipe wrenches were based on patents by William O. Thewes and were the first pipe wrenches to dethrone the well-known Stillson design as the "king" of pipe wrenches. The company continues in operation today as Ridgid, and interested readers can find more information on their About page. Fig. 187. Ridgid 10 Inch Pipe Wrench, with Inset for Reverse Detail. Fig. 187 shows a Ridgid 10 inch pipe wrench, marked "Trade Mark" and "Pat. 1727623", with "The Ridge Tool Co." and "Elyria, O. U.S.A." on the reverse. This wrench is covered by patent #1,727,623, issued to W.O. Thewes in 1929. Fig. 188. Ridgid 6 Inch Pipe Wrench, with Insets for Side View and Reverse Detail. Fig. 188 shows a somewhat later Ridgid 6 inch pipe wrench, marked with the Ridgid trademark and "Pat. 1727623", with "Ridge Tool Co." and "Elyria, O. U.S.A." on the reverse. The overall length is 5.5 inches closed and 6.5 inches fully extended. The finish is the familiar red paint. Some readers may be surprised to learn that Ridge Tool also made Stillson-pattern pipe wrenches. The next figure shows an example, not marked with a company name but identified via the patent marking. Fig. 189. Ridge Tool 8 Inch Stillson-Pattern Pipe Wrench. Fig. 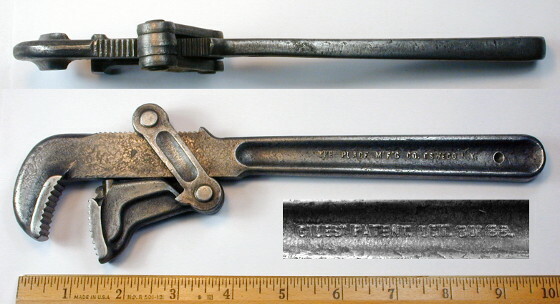 189 shows a Stillson-pattern 8 inch pipe wrench, marked "Improved Stillson" and "Made in U.S.A" in forged raised letters, and with a "Pat. No. 2076830" patent notice. The overall length is 7.0 inches closed and 8.1 inches fully extended, and the finish is red paint. The patent notice refers to patent #2,076,830, issued to W.O. Thewes in 1937 with assignment to Ridge Tool. Ridge Tool is best known for their Ridgid trademark, but the company also sold tools under the "Ritco" brand. Fig. 190. Ritco 1033C 15/16x1 Open-End Wrench, with Inset for Reverse Detail. Fig. 190 shows a Ritco 1033C 15/16x1 open-end wrench, stamped with the Ritco logo on the face. The shank is marked with "Chrome Alloy" in forged raised letters, with "Made in U.S.A" forged into the reverse. The overall length is 10.5 inches, and the finish is chrome plating. Fig. 191. Ritco "Chrome Alloy" 7/16 Combination Wrench, with Insets for Reverse and Side View. Fig. 191 shows a Ritco 7/16 combination wrench, marked with "Ritco" forged into a depression on the face, with "Chrome Alloy" forged into the shank. The reverse side is marked with the fractional size stamped on the face, with "Made in U.S.A" and the fractional size forged into the shank. The shank also has a code "7712" visible at the right. The overall length is 6.3 inches, and the finish is chrome plating. The Robert Wrench Company was a short-lived tool company operating in New York City, known primarily as the maker of a patented self-adjusting pipe wrench. The wrench patent was issued to Frederic P. Robert in 1922, but by 1926 the patents and production of Robert Wrench had been acquired by the Hoe Corporation. Fig. 192. Robert Self-Adjusting Pipe Wrench, with Inset for Reverse Detail. Fig. 192 shows a Robert self-adjusting pipe wrench, with forged-in markings "Patented & Patents Pending" on one side, and with "Robert Wrench Co. N.Y." on the reverse. The overall length is 8.5 inches, and finish is plain steel. The patent notice refers to patent #1,407,578, filed by Frederic P. Robert in 1921 and issued in 1922. 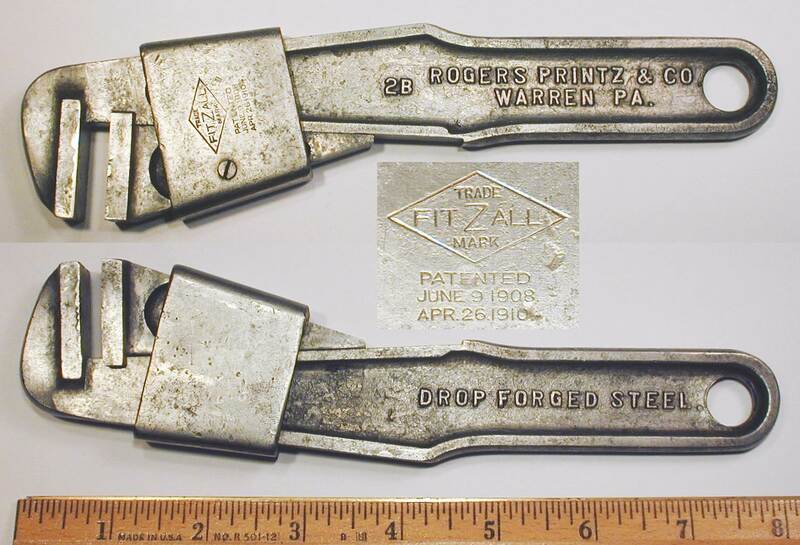 Rogers, Printz & Company was a maker of wedge-adjusting wrenches, founded in 1909 and operating in Warren, Pennsylvania. The small notice of incorporation at the near left was published on page 94 of the July 8, 1909 issue of the Iron Trade Review. The principals are listed as A.M. Printz, James P. Rogers, and William R. Rogers, and the capital stock was $50,000. The company's products were based on patents by John R. Long, initially on the earlier patent #890,146, filed in 1908 and issued on June 9, 1908. Later products used patent #955,974, filed in 1909 and issued on April 26, 1910. The advertisement at the left, published on page 74 of the August, 1910 issue of Southern Machinery, illustrates the company's wedge-adjusting wrench. Similar wedge-adjusting wrenches based on the Long patents were later made by the Standard Wrench & Tool Company. Fig. 193. Rogers Printz 4 Inch Wedge-Adjusting Bicycle Wrench, with Inset for Reverse Detail, ca. 1908-1909. Fig. 193 shows an early Rogers Printz 4 inch wedge-adjusting bicycle wrench, produced as a souvenir for the Hudson-Fulton event of September 1909. The wrench is stamped "Souvenir Hudson-Fulton Celebration" and "New York, Sept. 25, '09" on the front, with "Mfg'd By Rogers, Printz & Company" and "Warren, PA." on the back, along with a "Pat'd June 9, 1908" patent date. The overall length is 4.4 inches, and the finish is nickel plating, with some losses due to rust. The patent date refers to patent #890,146, filed by J.R. Long in 1908 and issued later that year. 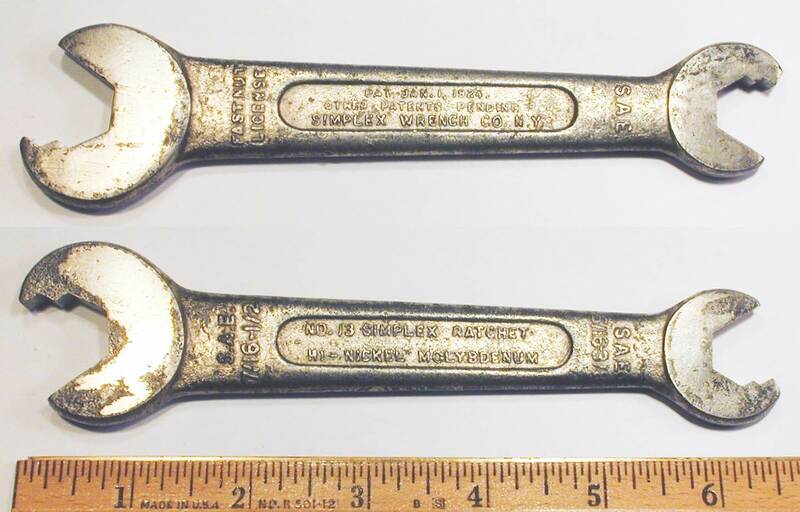 The markings on this wrench for both the patent date and the souvenir event date indicate a manufacturing date between June 1908 and September 1909, a fairly precise estimate for a tool more than 100 years old. The Hudson-Fulton Celebration was an event commemorating the 300th anniversary of Henry Hudson's discovery of the Hudson river, together with the (approximate) 100th anniversary of Robert Fulton's successful demonstration of a steamboat on the Hudson river. Further information on this event can be found in an article on Robert Fulton [External Link] published in the September 25, 1909 edition of Scientific American. Fig. 194. Rogers Printz 8 Inch Wedge-Adjusting Bicycle Wrench, with Insets for Reverse and Marking Detail, ca. 1910+. Fig. 194 shows a Rogers Printz 8 inch wedge-adjusting bicycle wrench, marked with "Rogers Printz & Company" and "Warren PA." forged into the handle, with "Drop Forged Steel" forged into the reverse. The sliding sheath is stamped with "FitZAll" and "Trade Mark" in a diamond outline, along with a "Patented June 9, 1908 Apr. 26 1910" patent notice. The first patent date refers to patent #890,146, filed by J.R. Long in 1908 and issued later that year. The second patent date refers to patent #955,974, filed by J.R. Long in 1909 and issued in 1910. The W.E. Rosel Company was a maker of automotive specialty tools operating in Columbus, Ohio. The company is currently known only for its "5 In 1" tool, which combined a spark-plug wrench, alligator wrench, and gap-setting gauge. Fig. 195. Rosel "5 In 1" Specialty Wrench, with Insets for Reverse and Side View, ca. 1919 to Early 1920s. Fig. 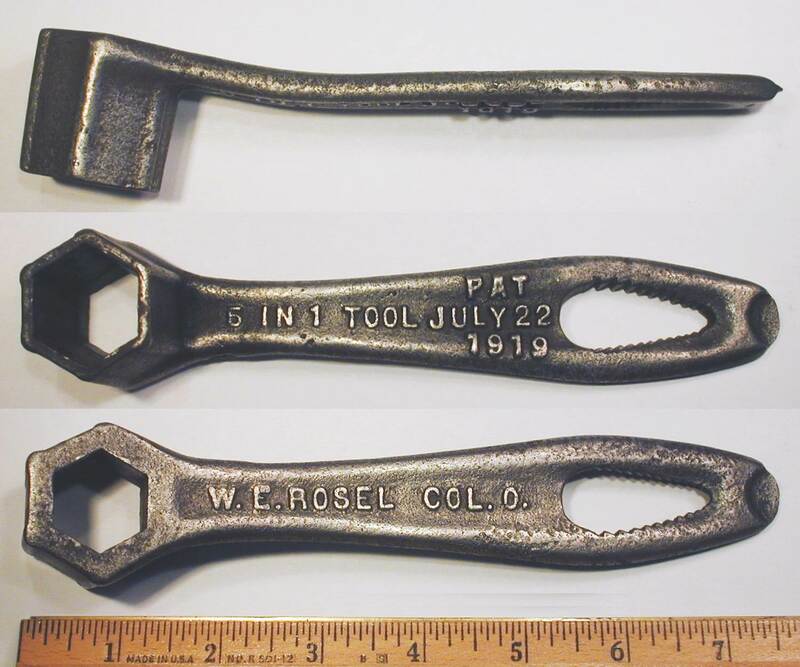 195 shows a Rosel "5 In 1" specialty wrench, marked with "W.E. Rosel" and "Col. O." cast into the shank, with "5 In 1 Tool" and "Pat July 22 1919" cast into the reverse. The overall length is 7.5 inches, and the finish is plain steel. The patent date refers to design patent #D53,641, filed by W.E. Rosel in 1919 and issued later that year. 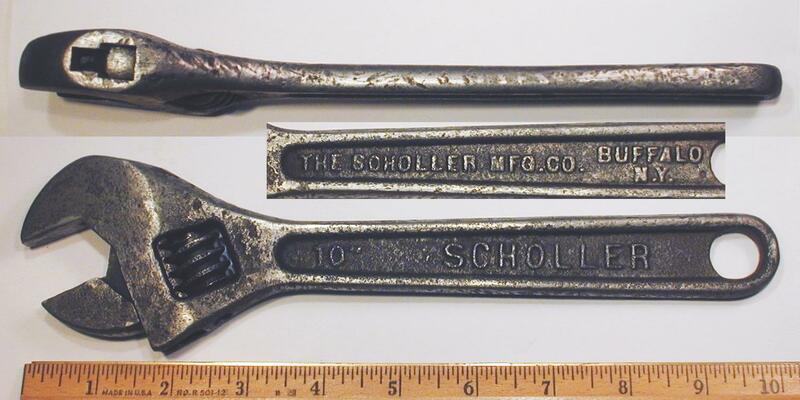 The Scholler Manufacturing Company operated in Buffalo, New York as a maker of adjustable wrenches and possibly other tools. Published references indicate that the company was in operation by 1915 (or earlier) and remained in business at least through the 1920s. The notice at the left was published on page 167 of the October, 1915 issue of The Automobile Journal and describes the Scholler adjustable wrenches. Fig. 196. Scholler 8 Inch Adjustable Wrench, with Insets for Side View and Marking Detail. Fig. 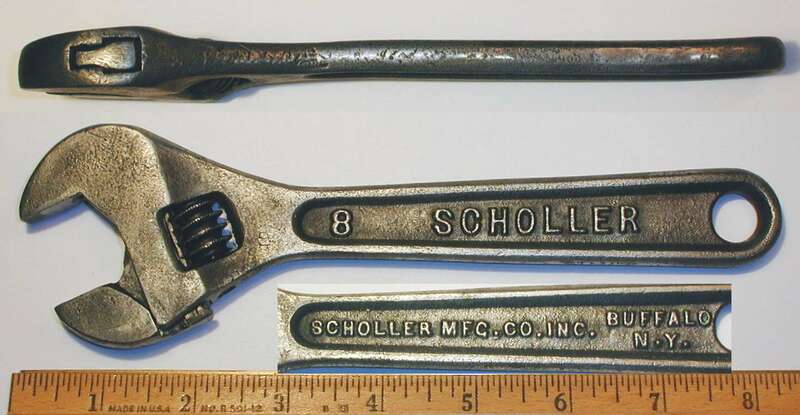 196 shows a Scholler 8 inch adjustable wrench, marked with the Scholler name forged into the handle, with "Scholler Mfg. Co. Inc." and "Buffalo N.Y." forged into the reverse. The overall length is 8.2 inches, and the finish is plain steel. The top inset shows a side view of the wrench, illustrating the relatively thick head and stepped rectangular keyway. Fig. 197. Scholler 10 Inch Adjustable Wrench, with Insets for Side View and Marking Detail. Fig. 197 shows a Scholler 10 inch adjustable wrench, marked with the Scholler name forged into the handle, with "The Scholler Mfg. Co." and "Buffalo N.Y." forged into the reverse. The overall length is 10.0 inches, and the maximum opening is 1.3 inches. The finish is plain steel. The William Schollhorn Company of New Haven, Connecticut was a well-known maker of parallel-jaw pliers and other tools in the late 19th and early 20th centuries. The company was incorporated in 1891 and remained active through the first part of the 20th century, and was eventually acquired by the Sargent Company in 1948. Schollhorn is probably best known for its distinctive parallel-jaw pliers, produced under the numerous patents issued to W.A. Bernard. These pliers featured precisely-formed sheet metal handles with embossed designs, a type of construction that offered lighter weight and lower cost than comparable forged handles. Fig. 198. Schollhorn Bernard 4 Inch Parallel-Jaw Pliers, with Insets for Side View and Construction Detail. The handles are also stamped "Bernard" in a center panel, a reference to the inventor of these and many other similar models. The overall length is 4.5 inches, and the finish is nickel plating. The patent date refers to patent #1,064,956, filed by W.A. Bernard in 1907 but not issued until 1913. The patent describes a method of forming sheet-metal handles for pliers. Fig. 199. 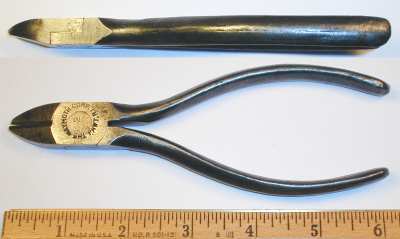 Schollhorn Ideal Lineman's Pliers, with Inset for Side View. Fig. 199 shows a pair of Schollhorn "Ideal" lineman's pliers, stamped "W. Schollhorn Co." and "New Haven, Conn." around the pivot. The handle has a patent notice "Pat. May 2, 1905 Apr. 2, 1907" stamped on the side, and the other handle is stamped "Ideal". The overall length is 7.5 inches, and the finish is nickel plating. The first patent date refers to patent #788,575, filed by W.A. Bernard in 1904 and issued in 1905. The second date corresponds to patent #848,877, filed by W.A. Bernard in 1905 and issued in 1907. O.P. Schriver & Company was a maker of pumps and other hardware items operating in Cincinnati, Ohio. A 1906 issue of the Hardware Dealer's Magazine noted the company as a maker of wire cloth and netting, and a 1907 report by the Ohio Secretary of State listed the company's products as "Pumps, etc. ", with a capital stock of $20,000. The company's earlier address appears to have been at 208 Elm Street in Cincinnati, but by 1914 the address was being reported as 621 East Pearl Street. A 1918 bulletin by the Industrial Commission of Ohio reported a total of 25 employees at that time. 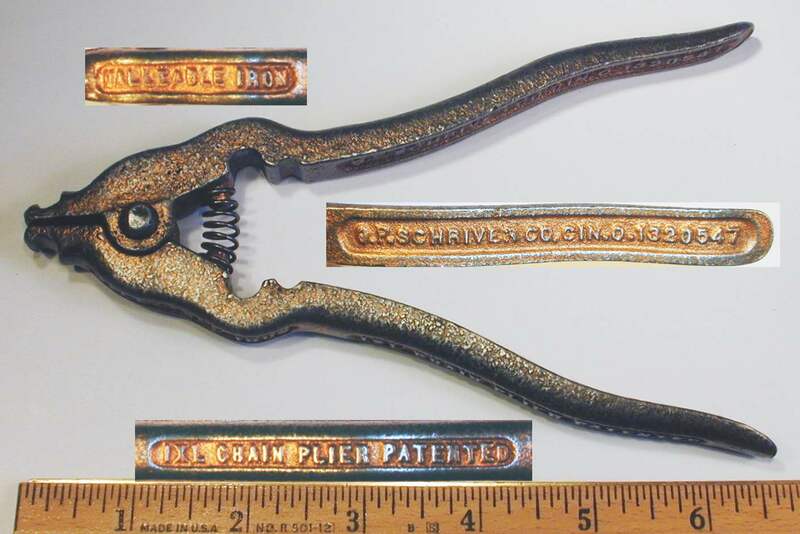 In later years the company produced a line of chain repair pliers described by patent #1,320,547, issued in 1919 to E.P. Happensack and assigned to the company. The next two figures show examples of the Schriver IXL 7 inch pliers, with minor differences in the forged-in markings. Fig. 200. Schriver IXL 7 Inch Chain Repair Pliers, With Insets for Marking Detail. Fig. 200 shows a pair of Schriver IXL 7 inch chain repair pliers, marked with "IXL Chain Plier Patented" and "Malleable Iron" forged into the handles, with "OP Schriver Co. Cin. O." and "1320547" forged into the undersides. The overall length is 6.9 inches. The finish is plain steel with traces of a coppery paint, although it's not known whether the paint is original. 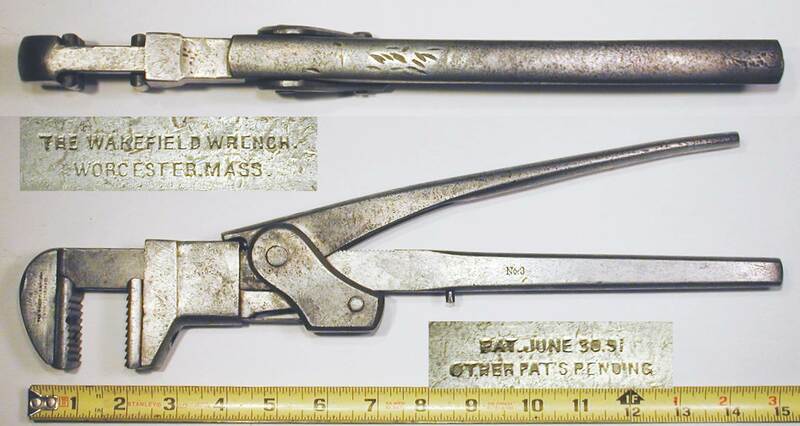 The pliers are marked with patent #1,320,547, filed by E.F. Happensack in 1919 and issued later that year. Fig. 201. Schriver IXL 7 Inch Chain Repair Pliers, With Insets for Marking Detail. Fig. 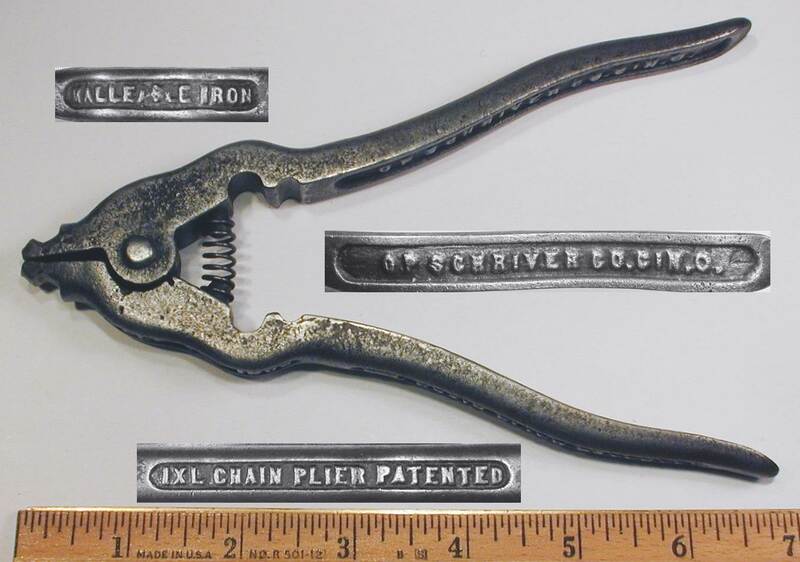 201 shows another similar pair of Schriver IXL 7 inch chain repair pliers, marked with "IXL Chain Plier Patented" and "Malleable Iron" forged into the handles, with "OP Schriver Co." and "Cin. O." forged into the undersides. The "Patented" marking refers to patent #1,320,547, filed by E.F. Happensack in 1919 and issued later that year. R.F. Sedgley, Inc. was founded by the eponymous Reginald F. Sedgley, an inventor with several patents for ratchet wrenches and socket-related tools. The company was located in Philadelphia and was operating by 1916 or earlier. R.F. 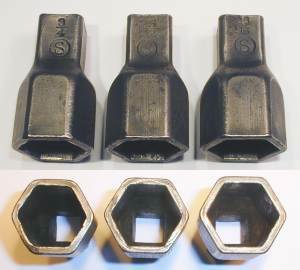 Sedgley's best-known products were the line of "Hexall" brand socket sets, which were offered by a number of industrial distributors in the years before and shortly after 1920. Sedgley filed a trademark application for "HEXALL" on March 17, 1916, with the first use date listed as January 24, 1916. The application was published as Serial No. 93,613 in Vol. 225 No. 4 of the USPTO Gazette, but we haven't found the actual trademark registration yet. The notice at the left was published on page 98 of the November 25, 1916 issue of Hardware Age and describes the Hexall socket wrench set. The text notes that the sockets were made of bar steel and case hardened, making this an early example of broached (rather than pressed-steel) sockets. Fig. 202. R.F. 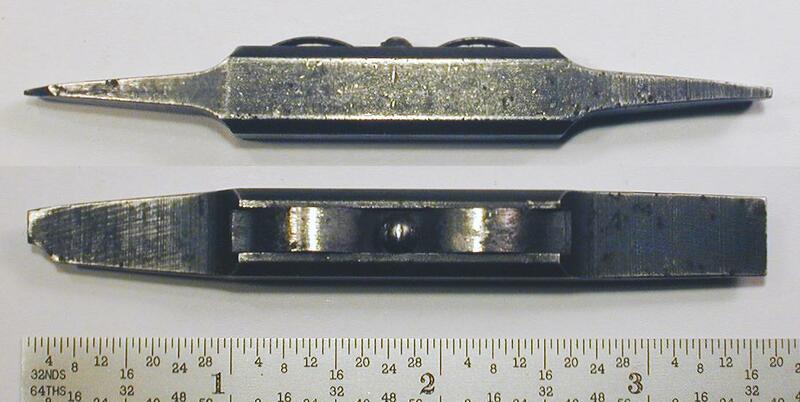 Sedgley "Hexall" 1/2-Hex Drive Ratchet, with Insets for Reverse and Side View, ca. 1917-1920. Fig. 202 shows a 1/2-hex drive Sedgley "Hexall" ratchet, marked with "Ratchet Socket Wrench" and "Pat. May 1, 1917" forged into the handle. The reverse is marked "Forged Steel" with "R.F. Sedgley, Inc." and "Phila. PA. U.S.A.", plus another "Hexall" marking. The patent date refers to patent #1,224,223, filed in 1917 by R.F. Sedgley and issued in the same year. The Simplex Wrench Company is known primarily for their distinctive open-end wrenches with stepped sizes and a ratcheting action. These wrenches were offered by Snap-On in their Motor Tool Specialty catalogs of the mid 1920s, giving the company a national footprint for sales. The next two figures show examples of the Simplex No. 11 wrench, with differences in the markings and alloy steel content. Fig. 203. Simplex No. 11 7/16x15/16 Ratcheting Open-End Wrench, with Inset for Reverse Detail, ca. 1924-1927. Fig. 203 shows a Simplex No. 11 ratcheting open-end wrench with depressed panels and numerous forged-in markings. 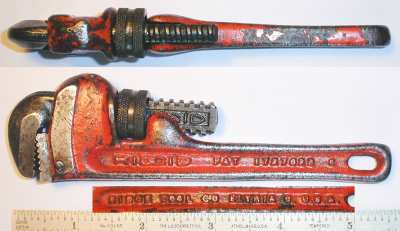 The front is marked "Simplex Ratchet" with "Chrome Vanadium", and the reverse shows "Simplex Wrench Co N.Y." plus patent notices and "Fastnut License". The overall length is 6.8 inches, and the finish is plain steel with a few traces of the original nickel plating. The first patent notice states "Pat. Jan. 1, 1924" and refers to patent #1,479,772, filed by W.H. Cook in 1922. A second notice states "Other Patents Pending", but the corresponding patents have not yet been found. Fig. 204. Simplex No. 11 7/16x15/16 Ratcheting Open-End Wrench, with Inset for Reverse Detail, ca. 1924-1927. Fig. 204 shows another Simplex No. 11 7/16x15/16 ratcheting open-end wrench, marked with "No. 11 Simplex Ratchet" and "Nickel Molybdenum" forged into the front panel, with the S.A.E. sizes forged into the shank. The reverse side has "Simplex Wrench Co N.Y." plus "Pat. Jan. 1, 1924" and "Other Patents Pending" forged into the panel, with "Fastnut License" and "S.A.E." near the ends. The overall length is 6.7 inches, and the finish is nickel plating. The patent date refers to patent #1,479,772, filed by W.H. Cook in 1922. The pending status refers in part to patent #1,624,508, filed by F.C. Reilly in 1925 and issued in 1927. 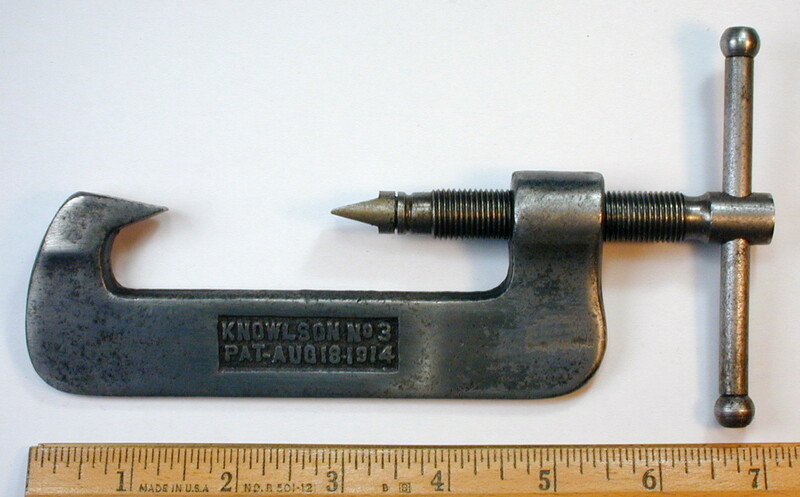 The opening sizes for the larger (left) end are marked "S.A.E. 7/16 1/2-5/8", corresponding to across-flats sizes 5/8, 3/4, and 15/16 respectively. The smaller (right) end opening sizes are marked "S.A.E. 1/4 5/16-3/8", corresponding to across-flats sizes 7/16, 1/2, and 9/16 respectively. Fig. 205. Simplex No. 12 1/2x15/16 Ratcheting Open-End Wrench, with Inset for Reverse, ca. 1924-1927. Fig. 205 shows a Simplex No. 12 1/2x15/16 ratcheting open-end wrench, marked with "No. 12 Simplex Ratchet" and "Chrome Vanadium" forged into the front panel, with "S.A.E." and "0" forged at the ends of the shank. The reverse panel is marked "Pat. Jan. 1, 1924" and "Other Patents Pending" with "Simplex Wrench Co. N.Y." near the bottom, with "Fastnut License" and "S.A.E." forged near the ends. The overall length is 6.6 inches, and the finish is nickel plating, with some losses due to rust. This wrench is unusual in not having the opening sizes forged into the shank. The opening sizes for the larger (left) end are 3/4 and 15/16, and for the smaller (right) end are 1/2, 9/16, and 5/8. Fig. 206. Simplex No. 13 1/2x3/4 Ratcheting Open-End Wrench, with Inset for Reverse, ca. 1924-1927. Fig. 206 shows a Simplex No. 13 1/2x3/4 ratcheting open-end wrench, marked with "No. 13 Simplex Ratchet" and "Hi-Nickel Molybdenum" forged into the front panel, with the (S.A.E.) size ranges forged into each end. The reverse panel is marked "Pat. Jan. 1, 1924" and "Other Patents Pending" with "Simplex Wrench Co. N.Y." near the bottom, with "Fastnut License" and "Reilly License" forged near the ends. The opening sizes for the larger (left) end are marked "S.A.E. 7/16-1/2", corresponding to across-flats sizes 5/8 and 3/4 respectively. The smaller (right) end opening sizes are marked "S.A.E. 5/16-3/8", corresponding to across-flats sizes 1/2 and 9/16 respectively. Fig. 207. Simplex No. 14 1/2x15/16 Ratcheting Open-End Wrench, with Inset for Reverse Detail, ca. 1927+. Fig. 207 shows a Simplex No. 14 1/2x15/16 ratcheting open-end wrench, marked with "No. 14 Simplex Ratchet" and "Nickel Molybdenum" forged into the front panel, with the size ranges forged into each end. The reverse panel is marked "Pat. 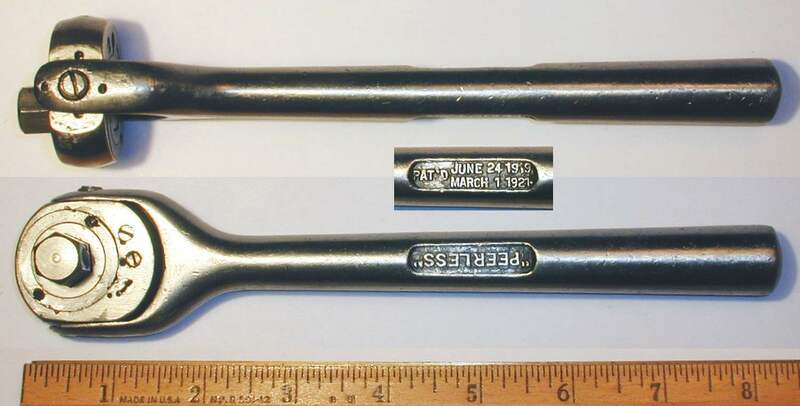 Jan. 1, 1924 & April 27, 1927" and "Other Patents Pending" with "Simplex Wrench Co. N.Y." near the bottom, with "Fastnut License" and "Reilly License" forged near the ends. The first patent date refers to patent #1,479,772, filed by W.H. Cook in 1922. The stepped openings allow the wrench to handle the three nut sizes 1/2, 9/16, and 5/8 on the small end, and two sizes 3/4 and 15/16 on the large end. Fig. 208. Simplex No. 15 3/4x15/16 Ratcheting Open-End Wrench, with Inset for Reverse Detail, ca. 1927+. Fig. 208 shows a Simplex No. 15 3/4x15/16 ratcheting open-end wrench, marked with "No. 15 Simplex Ratchet" and "Hi-Nickel Molybdenum" forged into the front panel, with the size ranges forged into each end. The reverse panel is marked "Pat. Jan. 1, 1924 & April 27, 1927" and "Other Patents Pending" with "Simplex Wrench Co. N.Y." near the bottom, with "Fastnut License" and "Reilly License" forged near the ends. The overall length is 8.1 inches, and the finish is nickel plating, with extensive losses due to rust and pitting. 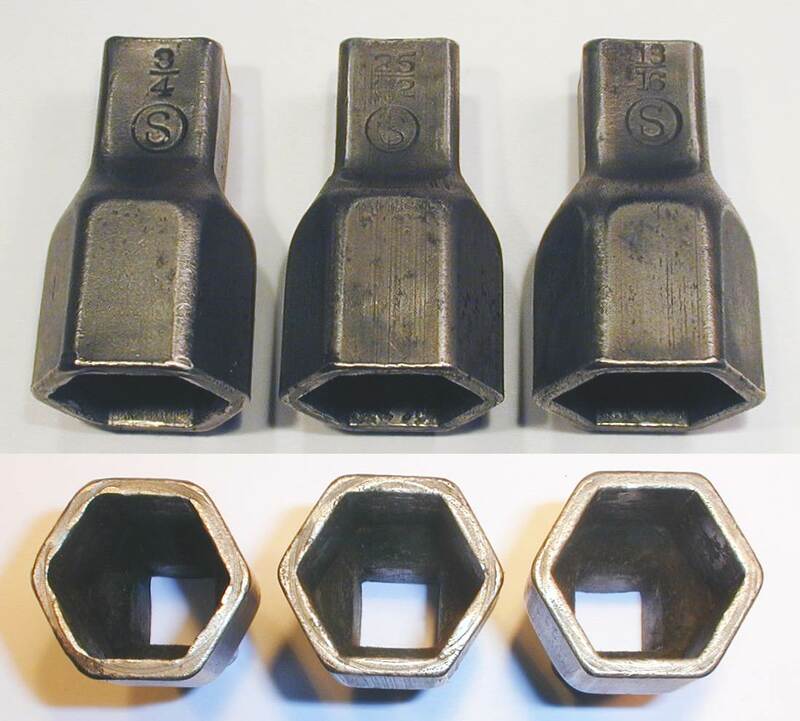 The stepped openings allow the wrench to handle nut sizes 3/4 and 7/8 on the small (right) end, and two sizes 13/16 and 15/16 on the large (left) end. 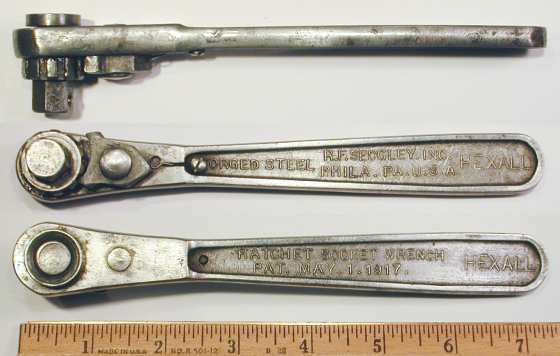 Later production of the Simplex wrenches was marked with the Frank C. Reilly Ltd. company name and used a patent by Reilly. Fig. 209. Simplex No. 9 5/16x1/2 Ratcheting Open-End Wrench, with Inset for Reverse Detail, 1935. Fig. 209 shows an example of the Reilly production, a Simplex No. 9 5/16x1/2 ratcheting open-end wrench. The wrench is marked with "No. 9 Simplex Ratchet" forged into the front panel, with "Reilly License" and "Fastnut License" forged into the shank. The reverse is marked with "Patent No. 1624508 Other Patents Pending" and "Frank C. Reilly Ltd. N.Y." forged into the depressed panel. The overall length is 5.4 inches, and the finish is chrome plating with polished faces. The patent notice refers to patent #1,624,508, issued to F.C. Reilly in 1927. The patents corresponding to the pending status (if issued) are not known. The stepped openings allow the wrench to handle the sizes 5/16 and 3/8 on the small end, plus sizes 7/16 and 1/2 on the large end. The front panel of this wrench is also marked with a forged-in code "L:M" which closely resembles a Bonney date code. (Bonney is known to have done contract production for other companies.) Assuming that this is a Bonney date code, it would likely indicate production in 1935. The Southington Manufacturing Company was founded in 1909 in Southington, Connecticut as a maker of tools, automobile tool kits, and forgings. The advertisement at the left was published on page 1142 of the June, 1922 edition of Hardware dealers' Magazine and illustrates an S-shaped wrench. The ad shows the SMCo logo on each side, with "S" over "M.Co" inside a circle. Fig. 210. SMCo 504 7/8x1 S-Shaped Open-End Wrench, with Inset for Marking Detail, ca. 1910s to 1920s. Fig. 210 shows a Southington "SMCo" 7/8x1 S-Shaped open-end wrench, marked with "Drop Forged" and the SMCo logo forged into the shank, and with "504" forged into the reverse [not shown]. The overall length is 10.2 inches, and the finish is plain steel. The inset shows a close-up of the SMCO logo on the shank, although it's not very clear. The Spring Leaf Lubricator Company operated in Ann Arbor, Michigan as the maker of Knowlson brand spring leaf spreaders. The company was in business by 1912, based on a notice in the November 23, 1912 issue of Automobile Topics announcing their spring leaf spreader tool. Other public notices and advertisements indicate that the company remained in business at least into the early 1920s. The advertisement at the left was published on page 157 of the October, 1915 issue of Motor and illustrates the company's Knowlson No. 1 spring leaf spreader. By 1918 the company was producing a slightly smaller Knowlson No. 3 spring spreader as well. The Knowlson spring spreaders were based on patent #1,108,111, filed by C.F. Adamson in 1912 and issued on August 18, 1914. Currently we're unsure of the origin of the "Knowlson" brand, as the patent does not list an assignment. Fig. 211. Knowlson No. 3 Spring Leaf Spreader, ca. 1918 to Early 1920s. Fig. 211 shows a Knowlson No. 3 spring leaf spreader, marked with "Knowlson No. 3" and "Pat. Aug 18 1914" forged (or cast) into the body. The overall length is 8.0 inches fully extended, and the length of the crossbar is 3.8 inches. The finish is plain steel. The patent date refers to patent #1,108,111, issued to C.F. Adamson in 1914. In use, the chisel points would be placed between two leaves of the spring and the screw tightened to force the leaves apart. A suitable lubricant (the company recommended a mixture of heavy grease and graphite) would then be applied to the springs. The Standard Wrench & Tool Company was a maker of adjustable wrenches and pipe wrenches operating in Providence, Rhode Island. The dates of operation for the company are a bit uncertain, but it appears in published lists of corporations from 1911 through at least 1918. The February 8, 1912 issue of The Automobile includes a description of the FITZALL wedge-adjusting wrench on page 453, with an illustration on the previous page. Some of the company's products were based on patents for wedge-adjusting wrenches issued to John R. Long, as illustrated in the following figure. Fig. 212. Standard Wrench FITZALL Wedge-Adjusting Wrench, with Insets for Side View and Marking Detail, ca. 1910-1920. Fig. 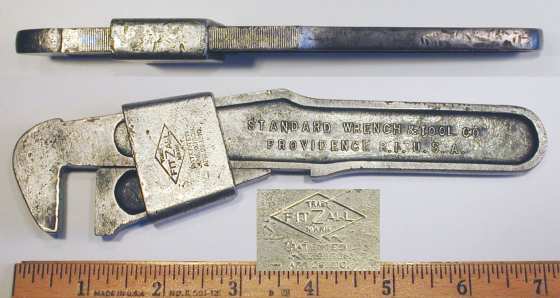 212 shows a Standard Wrench "FITZALL" wedge-adjusting nut wrench, marked with "Standard Wrench & Tool Co." and "Providence R.I. U.S.A." forged into the shank. The adjusting sleeve is stamped "Trade FITZALL Mark" inside a diamond outline, with "Patented June 9, 1908 Apr. 26, 1910" below (see inset). The reverse shank is also marked "Drop Forged Steel' (not shown). The first patent date refers to patent #890,146, filed by J.R. Long in 1908. The second patent date refers to patent #955,974, filed by J.R. Long in 1909. The L.S. 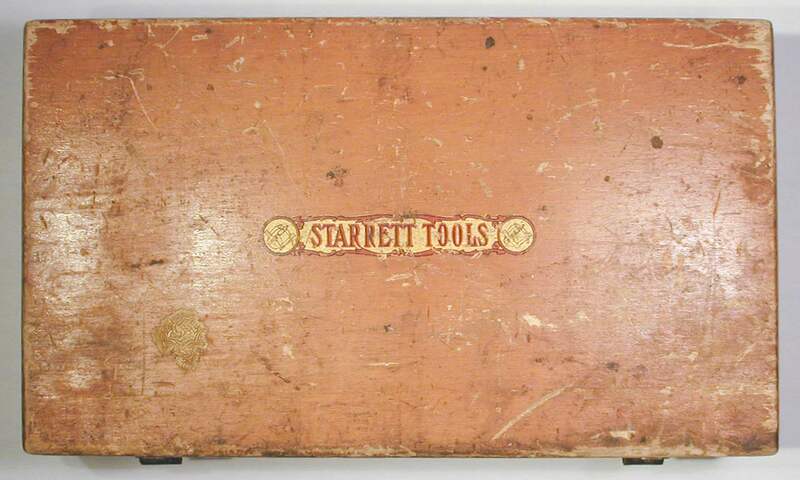 Starrett Company is an important maker of machinist's tools and precision measuring instruments, continuing in operation from its founding in 1880 to the present day. The company was founded by Laroy S. Starrett in Athol, Massachusetts. Starrett has published many catalogs during its long years of operations. Although the earlier catalogs were often printed without a publication date, the effective date of publication can be estimated using printed advertisements for the various catalog editions. Starrett was a frequent advertiser in magazines and trade journals such as Popular Mechanics, Popular Science, and the Machinists Monthly Journal. Some of the catalog editions noted in advertisements include No. 18 in 1910, No. 19 in 1912, No. 20 in 1913, No. 21 in 1917, No. 22 in 1921, No. 23 in 1926, No. 24 in 1928, and No. 25 in 1930. Fig. 213. Starrett No. 1-7 Compound Action Cutting Pliers, with Insets for Side View and Jaw Detail. Fig. 213 at the left shows a pair of Starrett No. 1-7 compound action cutting pliers, stamped "The L.S. Starrett Co." and "Athol, Mass. U.S.A." on the upper arm, with the model number on one handle. The cutter inserts are marked "For Music Wire", as seen in the lower inset. The overall length is 7.0 inches. The finish is polished steel, possibly with a thin nickel plating. The Starrett socket sets used pressed-steel sockets, making them similar in appearance to the familiar Mossberg or Walden sockets. However, Starrett used a non-standard design with a narrow 5/8 square base for the sockets, making them incompatible with the sockets produced by Mossberg and the rest of the industry. As a result of the narrow base, Starrett sockets could not be driven from the inside with a standard 1/2 square drive stud. The Starrett No. 443 socket sets were probably first produced around 1911, the date of the patent filing for the ratchet supplied with the sets. Our earliest catalog reference for the set is from Starrett catalog No. 20, published around 1913. We have several examples of the L.S. Starrett socket sets and are currently preparing them for display. Fig. 214. Starrett No. 443-A Pressed-Steel Socket Set, ca. 1913-1915. Fig. 214 shows an early Starrett No. 443-A socket set in sturdy wooden box. The drive tools consist of a No. 443 ratchet, an extension, a universal, and a drilling attachment, plus a few miscellaneous items. The generous collection of sockets includes 27 standard hex sockets, two square sockets, and one spark-plug (deep) socket. The standard hex sockets include the 23 sizes from 5/16 to 1 inch by 32nds, plus the four larger sizes 1-1/32, 1-3/32, 1-5/32, and 1-9/32. The sockets are all marked with the fractional size and the Starrett S-Circle logo. The set as shown is missing the 11/16 and 11/32 sockets. The square sockets in the set have sizes 13/32 and 21/32, of which one (the 21/32) is missing in this example. The spark-plug socket (near the center of the set) has size 29/32. When considering the sizes in the socket set, keep in mind that Starrett pressed-steel socket sizes were specified as 1/32 oversize, as was the case with Mossberg and other brands of pressed-steel sockets. A discussion of this confusing convention can be found in the section on Size Conventions in our article on the Frank Mossberg Company. Fig. 215 at the left shows a more detailed view of the lower compartment of the socket set. The top two rows hold the majority of the hex sockets, followed by a row with the remaining three hex sockets at the left, a 29/32 spark-plug (deep) socket in the center, and a universal joint at the right. The next row down has pegs for two square sockets (one is missing) at the left, with a circular knob in the center and the packer drill attachment at the right. Fig. 215. Detail for Starrett No. 443-A Socket Set, ca. 1913-1915. The circular knob is referred to as a "thrust plug" in later catalogs, but is not listed in Starrett catalog No. 20. The thrust plug could be inserted in the drive end of a socket or extension to provide a smooth surface for exerting palm pressure. The tools at the bottom of the photograph are the No. 443 ratchet and a 6 inch extension. The ratchet in the set is marked "Pat. Applied For", a reference to patent #1,167,948, filed in 1911 by L.S. Starrett et al and issued in 1916. Since later ratchets are known to have been marked with the patent date, the pending status for this ratchet suggests that this is an early set, probably made between 1913 and 1915. Earlier sets made from 1911 to 1913 probably did not include the thrust plug piece, based on its omission from catalog No. 20. Fig. 216. Top Cover of Starrett No. 443-A Socket Set, ca. 1913-1915. Fig. 216 shows the top cover of the early Starrett No. 443-A socket set, marked with a decorative "Starrett Tools" decal in the center. The dimensions of the box are 14.0 inches wide by 8.1 inches deep by 3.5 inches high. The next two figures show examples of the Starrett No. 443 ratchet, beginning with the ratchet from the early set. Fig. 217. Starrett No. 443 5/8-Drive Ratchet, with Insets for Side View and Marking Detail, ca. 1911-1915. Fig. 217 shows the Starrett No. 443 ratchet from the early No. 443-A socket set, stamped "The L.S. Starrett Co." and "Athol, Mass. U.S.A." on the head, with "Pat. Applied For" below. The overall length is 11.0 inches, and the finish is polished steel. The pending status refers to patent #1,167,948, filed by L.S. Starrett et al in 1911 and issued in 1916. Fig. 218. Starrett No. 443 5/8-Drive Ratchet, with Insets for Side View and Marking Detail, ca. 1916-1920. Fig. 218 shows a later Starrett No. 443 ratchet from a No. 443-B socket set. The head is stamped "The L.S. Starrett Co." and "Athol, Mass. U.S.A." with a "Patented Jan. 11, 1916" patent notice. The patent date refers to patent #1,167,948, filed in 1911 by L.S. Starrett et al. Fig. 219. Starrett 6 Inch Extension from No. 443-A Set, with Inset for Construction Detail, ca. 1913-1915. Fig. 219 shows the unmarked 6 inch extension from the early Starrett No. 443-A socket set. Fig. 220. Starrett Pressed-Steel Sockets from No. 443-A Set, with Inset for Construction Detail, ca. 1913-1915. Fig. 220 shows a group of three hex sockets from the early Starrett No. 443-A socket set, each stamped on the base with the fractional size and S-Circle logo. The socket sizes are, from the left, 3/4, 25/32, and 13/16. The finish is plain steel. Fig. 221. Starrett Screwdriver Bit from No. 443-A Set, with Inset for Side View, ca. 1915-1916. Fig. 221 shows the unmarked screwdriver bit from the early Starrett No. 443-A socket set, consisting of a square shank with a spring clip riveted in the center. The shank of the bit is approximately 13/32 square, the size required to fit in the drive end of a socket, i.e. with the socket used as a bushing. The overall length is 3.5 inches, and the finish is plain steel. Storage for the screwdriver bit was provided by a wooden bracket on the inside of the lid, as seen in the Starrett No. 443-A Set photograph above. Fig. 222. Starrett Thrust Plug from No. 443-A Set, with Insets for Side and Top Views, ca. 1915-1916. Fig. 222 shows the unmarked thrust plug from the early Starrett No. 443-A socket set, designed to fit into the drive end of the Starrett sockets. The shank is flattened on one side with a spring clip on the opposite side. The overall height is 1.0 inches, and the diameter of the top is 0.96 inches. The finish is plain steel. Fig. 223. Starrett 5/8-Drive Drill Attachment from No. 443-A Set. Fig. 223 shows the unmarked drill attachment shown with the early Starrett No. 443-A socket set. The drill attachment consists of a 5/8-drive adapter threaded to screw into the knurled body, and the drive end of the adapter has a tapered square opening (not shown) for holding the drive stud of an older-style drill bit. The overall length is 5.1 inches in the retracted position. The finish is plain steel. In 1909 H.E. Stephens received patent #943,757 for an open-end wrench with an adjustable offset angle. Fig. 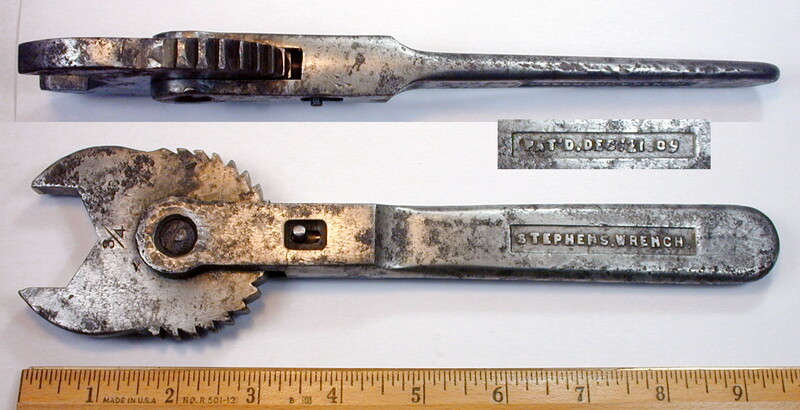 224 shows a rare Stephens patent 1-1/4 angle wrench, marked with "Stephens Wrench" forged into the handle, with "Pat'd. Dec. 21, 09" forged into the reverse. The overall length is 9.4 inches, and the finish is plain steel, with traces of nickel plating. The wrench face is stamped with "3/4", a reference to the older U.S.S. size convention for the 1-1/4 opening. The patent date refers to patent #943,757, filed in 1908 by H.E. Stephens and issued in 1909. The St. Pierre Chain Corporation was founded in Worcester (Massachusetts) in 1920 as a maker of tire chains. The founder was Henry St. Pierre, an inventor from Vermont who had created an improved type of tire chains. The company later added automotive service tools and chain-repair tools to its product line, and later still began making pitching horseshoes for the game of horseshoes. The company continues in operation today as the St. Pierre Manufacturing Corporation, and interested readers can visit their web site at www.stpierreusa.com [External Link] for further information. Our coverage here will focus on their automotive service tools, and we have a number of examples of pliers, wrenches, and chain-related tools to show. Fig. 225. St. Pierre [No. 1] Chain-Repair Pliers, with Insets for Side View and Marking Detail, ca. 1925-1928. Fig. 225 shows an early pair of St. Pierre [No. 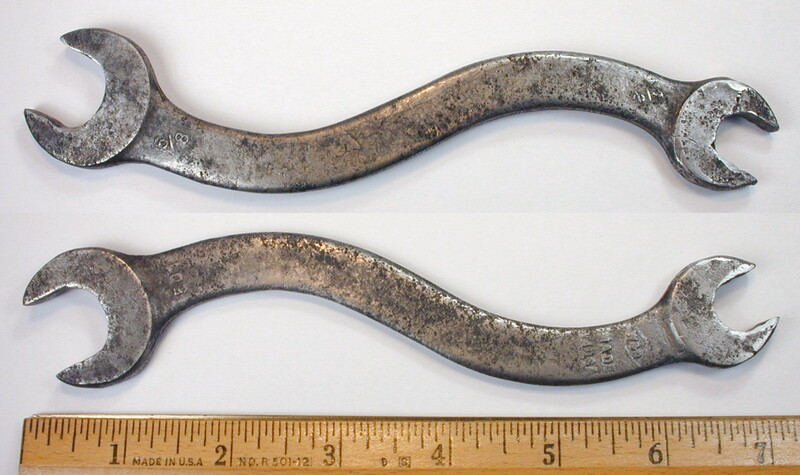 1] chain-repair pliers, marked with "St. Pierre" and "Worcester Mass U.S.A." forged into one handle, with "Pat Pending" forged into the reverse. No model number was marked on this example, but this model is marked as "No. 1" in the next figure. The overall length is 9.4 inches, and the finish is nickel plating. The patent pending status corresponds to the patent #1,657,978, filed by H. St. Pierre in 1925 and issued in 1928. Fig. 226. St. Pierre No. 1 Chain-Repair Pliers, with Insets for Side View and Marking Detail, ca. 1925-1928. Fig. 226 shows another pair of St. Pierre No. 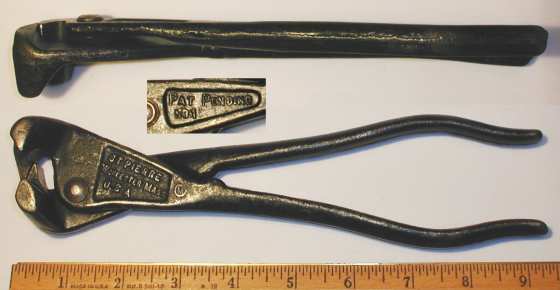 1 chain-repair pliers, with forged-in markings for the company name and "Worcester Mass U.S.A." near the pivot, and with the model number and a "Pat Pending" notice on the reverse. The overall length is 9.4 inches, and the finish is black paint. The pliers are also marked with the M-Circle logo of the Moore Drop Forging Company, indicating that these pliers were made by Moore. Fig. 227. St. Pierre Compound-Leverage Chain-Repair Pliers, with Insets for Side View and Marking Detail, ca. 1929 to 1930s. Fig. 227 shows a pair of St. Pierre 11 inch compound-leverage chain-repair pliers, marked with "Pat. No. 1657978-1658995-1710554" forged into the handle. 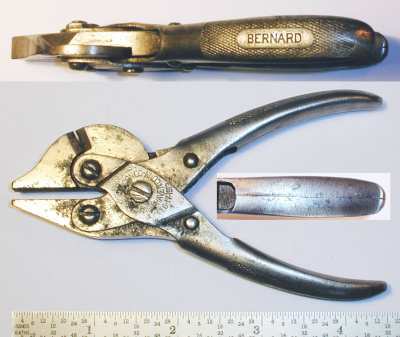 Although not marked with the company name, the pliers can be identified by the patent markings and resemblance to the St. Pierre No. 1 pliers. The overall length is 10.9 inches, and the finish is plain steel. The first patent number listed on the handle is #1,657,978, filed by H. St. Pierre in 1925 and issued in 1928. The second patent number listed is #1,658,995, filed by J.N. MacDonald in 1925 and issued in 1928. The third patent number listed is #1,710,554, filed by H. St. Pierre in 1926 and issued in 1929. Fig. 228. St. Pierre 1/2x9/16 Offset Box Wrench, with Insets for Side View and Reverse Detail. Fig. 228 shows a St. Pierre 1/2x9/16 offset box wrench, stamped "Chrome Alloy" on the shank, with "St. Pierre" on the reverse. Fig. 229. St. Pierre 9/16x5/8 Battery Terminal Box-End Wrench, with Inset for Side View. Fig. 229 shows a St. Pierre 9/16x5/8 battery terminal box-end wrench, stamped with "St. Pierre" and "Worcester, Mass." on the shank. The overall length is 5.9 inches, and the finish is cadmium plating. The Superior Wrench Company was a maker of self-adjusting pipe wrenches operating in Marshalltown, Iowa. The company was founded in 1909 as the Lake Superior Wrench Company in Sault Ste Marie, Michigan, but by 1910 had moved to the Iowa location. The company name was later simplified by dropping the leading "Lake". The company's best known product was a self-adjusting pipe wrench described by the Munro 1909 #933,096 and Boulieu 1910 #972,052 patents. The early advertisement at the left appeared in a 1909 issue of Technical World Magazine and refers to the tool as an "Automatic Auto Wrench". The ad offers the 12 inch model for $1 prepaid, or a set of four wrenches with sizes from 6 to 16 inches for just $3 prepaid. At this time the company was still the Lake Superior Wrench Company, and the address is listed as 124 Maple Street, Sault Ste. Marie, Michigan. A brief article [External Link] in the March, 1910 issue of Hardware Dealer's Magazine describes the operation and advantages of the wrenches, and an illustration shows models available from 6 inches up to 20 inches. Fig. 230. 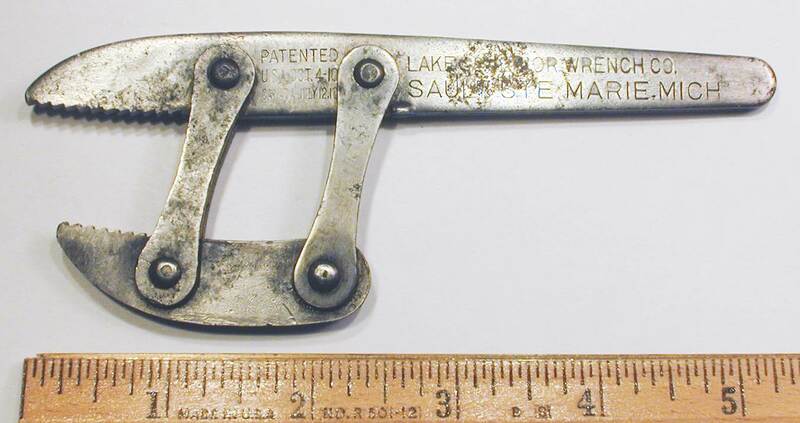 Lake Superior 6 Inch Self-Adjusting Pipe Wrench, 1910. Fig. 230 shows an early Lake Superior 6 inch self-adjusting pipe wrench, stamped "Lake Superior Wrench Co." and "Sault Ste. Marie, Mich." on the handle. The wrench is also marked with a patent notice "Patented U.S.A. Oct. 4-10 Canada July 12-10" stamped between the swing arms. The overall length is 5.4 inches with the jaw retracted, and the maximum opening is 0.75 inches. The finish is plain steel, with pitting due to rust. The first patent date refers to patent #972,052, filed by J. Boulieu in 1909 and issued in 1910. The markings for the 1910 patent date and earlier company location indicate production in 1910. Fig. 231. Lake Superior 16 Inch Self-Adjusting Pipe Wrench, with Inset for Marking Detail, ca. 1909-1910. Fig. 231 shows an earlier Lake Superior 16 inch self-adjusting pipe wrench, marked with "Lake Superior Wrench Co." and "Sault Ste. Marie, Michigan" forged into the handle, and with a "Pat. Pend." patent notice stamped between the swing arms. The overall length is 16.0 inches with the jaw retracted and 17.5 inches fully extended. The maxiumum opening is approximately 2.0 inches. The finish is plain steel, with pitting due to rust. The pending status refers to patent #972,052, filed by J. Boulieu in 1909 and issued in 1910. Fig. 232. Superior 12 Inch Self-Adjusting Pipe Wrench, with Inset for Side View, ca. 1910-1920. Fig. 232 shows a later Superior 12 inch self-adjusting pipe wrench, marked with "Superior Wrench Company" forged into the handle. The overall length is 12.0 inches with the jaw retracted, and the maxiumum opening is 1.3 inches. The finish is plain steel, with extensive pitting due to rust. In 1876 Henry B. Todd received patent #182,615 for end nippers with replaceable cutting edges. 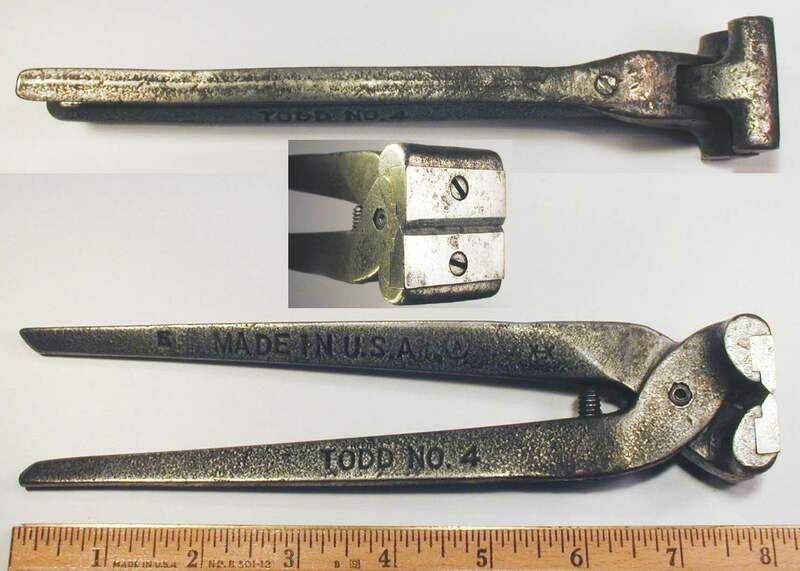 The Todd design became very popular and remained in production for many years, with the nippers typically marked "Todd" but without a clear maker's name. Fig. 233. Todd No. 4 8 Inch End Nippers, with Insets for End and Side View. Fig. 233 shows a pair of Todd No. 4 8 inch end nippers, stamped "Made in U.S.A." with an "E" code and hex logo. Although not marked with a patent notice, these nippers are described by patent #182,615, filed in 1876 by H.B. Todd and issued later that year. Tower & Lyon was a tool maker in New York city, active between 1884 and 1916. The company produced a wide variety of wrenches, including adjustable bicycle wrenches and pipe wrenches. Fig. 234. Tower & Lyon Baxter Patent Adjustable Wrench. Fig. 234 shows a Baxter patent adjustable wrench, marked "T. & L." with "Baxter's Pat." above but partially obscured. The "T. & L." marking is presumed to indicate to Tower & Lyon, a well-known maker of adjustable wrenches in the late 19th century. The overall length is 3.9 inches, and the finish is polished steel. The patent notice refers to patent #84,605, issued to William Baxter in 1868. Wrenches of this design were first produced by the Baxter Wrench Company, and then later by Green, Tweed, & Company. The adjusting screw in the center has threaded studs of opposite pitch on each end, moving the two wrench sections to adjust the openings at each end. 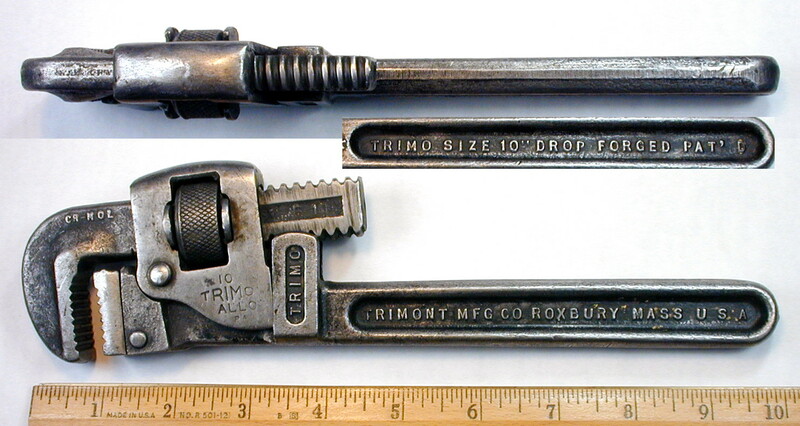 Trimont Manufacturing was a maker of pipe wrenches, plumbing tools, and nut wrenches operating in Roxbury, Massachusetts, and selling primarily under the "Trimo" brand. The company was founded in the 1890s. The ad at the left was published in the February, 1900 issue of the Journal of Railway Appliances and shows Trimo pipe wrenches, chain pipe wrenches, combination nut and pipe wrenches, and pipe cutters. A later advertisement for the company's wrenches can be seen at the left, published on page 585 of the October, 1911 edition of the Automobile Trade Directory. One of the company's popular products was an improved Stillson style pipe wrench based on patent #1,012,037, filed in 1911 by J.H. Vinton and issued later that year, with assignment to Trimont Manufacturing. Fig. 235. Trimo 10 Inch Pipe Wrench, with Insets for Side View and Reverse Detail, ca. Mid 1930s to 1940s. Fig. 235 shows a Trimo 10 Inch pipe wrench, marked with "Trimont Mfg Co" and "Roxbury Mass USA" forged into the shank, with "Trimo Size 10" and "Drop Forged Pat'd" forged into the reverse. The carrier shell is also stamped "Trimo Alloy", and the movable jaw has "Cr Mol" forged in near the bend. The overall length is 9.6 inches closed and 11.0 inches fully extended. The finish is plain steel. The patent notice corresponds to patent #1,012,037, issued to J.H. Vinton in 1911 with assignment to Trimont Manufacturing. 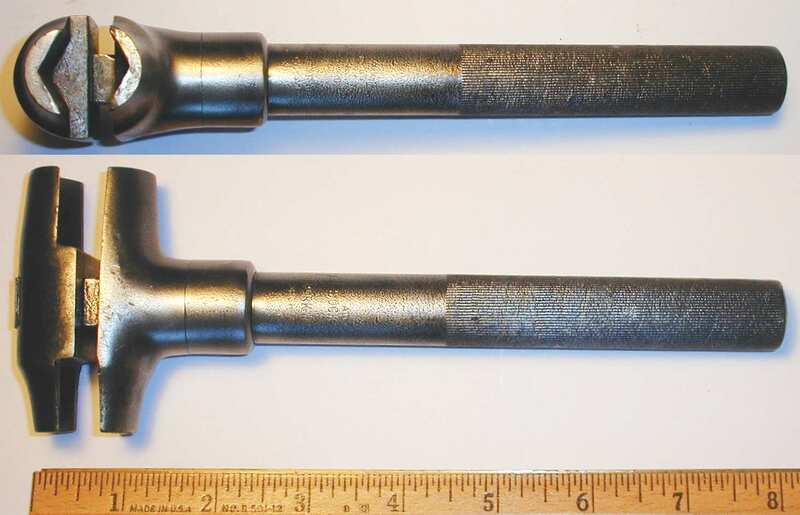 A review of published references found the Trimo alloy pipe wrenches first mentioned in 1934, with continuing references into the 1940s. The Truecraft Tool Company was a maker of wrenches and other tools operating in Chicago, Illinois during the late 1940s and 1950s. Based on trademark applications, the company was formed in 1947 as the successor to the Otto Kaufman Company. Truecraft Tool registered two trademarks, both stylized forms of "TRUECRAFT", and listed the date of first use as December 30, 1947. The trademark applications give the company's address as 2425 South Michigan Avenue in Chicago. The archive.org online resource has a 1959 Truecraft Tool Catalog showing tools at that time, including adjustable wrenches, several models of pliers, a hammer, and other items. Based on the items in the catalog, the company's customers were probably hardware stores. We have a few examples of tools believed to represent the production of the Truecraft Tool Company. Truecraft [Stylized] 12/30/1947 03/12/1948 09/09/1952 563,957 Signed by Paul Kaufman, Vice President. Truecraft [Stylized] 12/30/1947 03/11/1953 02/16/1954 585,763 Signed by Paul Kaufman, Vice President. Fig. 236A. Truecraft Tool 3/16x13/32 Open-End Wrench, with Inset for Reverse Detail, ca. Late 1940s to 1950s. The overall length is 3.7 inches, and the finish is plain steel. Fig. 236B. Truecraft Tool B-105 5/8 Combination Wrench, with Inset for Reverse, ca. 1950s. Fig. 236B shows a Truecraft Tool B-105 5/8 combination wrench, stamped with "Truecraft" and "SW-5" on the polished area of the shank, with "Drop Forged Tool Steel" and the fractional size on the reverse. The polished areas on both sides are bracketed by stamped flag emblems. The overall length is 8.0 inches, and the finish is chrome plating. The shank also has a "5" code forged into the reverse side. Fig. 236C. Truecraft Tool B-106 11/16 Combination Wrench, with Inset for Reverse, ca. 1950s. Fig. 236C shows a Truecraft Tool B-106 11/16 combination wrench, stamped with "Truecraft" and "SW-6" on the polished area of the shank, with "Drop Forged Tool Steel" and the fractional size on the reverse. The polished areas on both sides are bracketed by stamped flag emblems. The overall length is 8.9 inches, and the finish is chrome plating. The shank also has forged-in markings for the fractional size on both sides, and an "N2" marking on the reverse side. The United Shoe Machinery Corporation was a major manufacturer of production machinery for the shoe making industry. Formed in 1899 by a merger of three companies, USMC became the dominant supplier of shoe making machinery in the United States. In addition to producing machinery, the company was also a maker of wrenches and other tools, probably primarily for repair and maintenance of its own equipment. Tools produced by USMC can be identified by the distinctive USMC-Script logo, typically forged into the tool. Note though that as the initials "USMC" are more famously associated with the U.S. Marine Corps, tools produced by United Shoe Machinery may sometimes be mistakenly considered as contract production for the military. Fig. 237. USMC 241H 3/8x5/8 Open-End Wrench, with Inset for Reverse Detail. Fig. 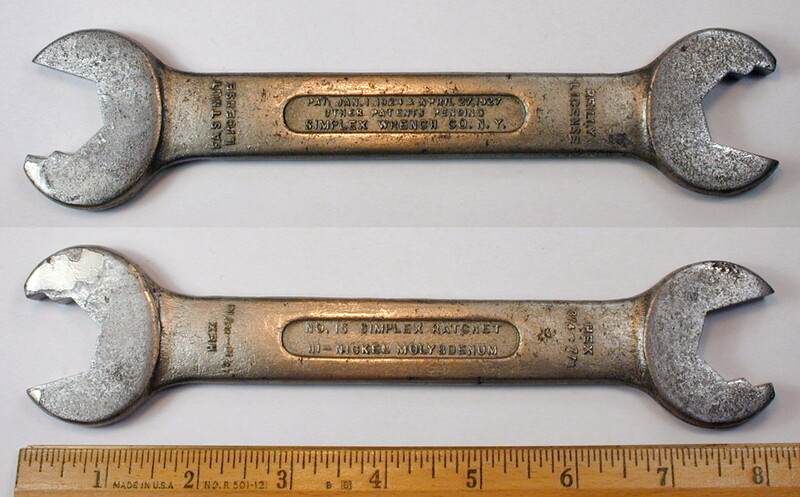 237 shows a USMC 241H 3/8x5/8 open-end wrench, marked with the USMC-Script logo forged into the shank, and with the model number stamped on the reverse face. The overall length is 5.4 inches, and the finish is plain steel. Fig. 238. USMC 642H 11/16x3/4 Open-End Wrench. Fig. 238 shows a USMC 642H 11/16x3/4 open-end wrench, marked with the USMC-Script logo forged into the shank. Fig. 239. USMC 1755H 1/2x5/8 Open-End Wrench, with Inset for Reverse. Fig. 239 shows a USMC 1755H 1/2x5/8 open-end wrench, stamped with the USMC-Script logo and model number on the faces, with the fractional sizes on the reverse faces. A company catalog from the mid 1950s notes that their production process uses Bradley power hammers to shape the tools, and claims that the process produces tougher steel than the common faster production methods, apparently a reference to drop-forging. 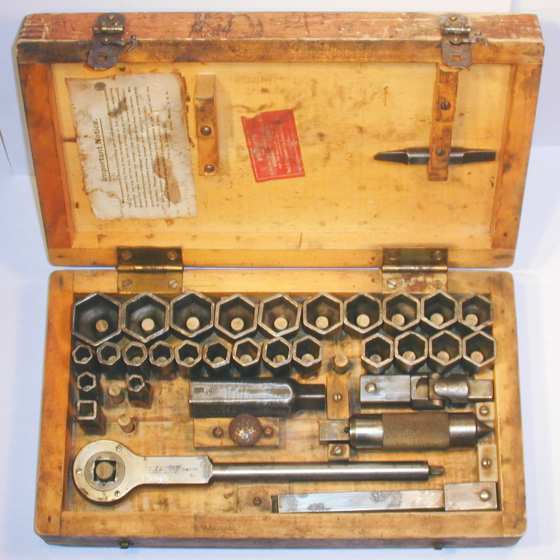 The tools available at this time included a variety of chisels, punches, scrapers, and screwdrivers, as well as wrenches in open-end, box-end, and combination styles. A later catalog No. 271 from 1971 offers a similar collection of tools, but with the addition of metric sizes in combination wrenches, plus a line of angle-head open-end wrenches with 15 and 60 degree offsets. The inside front cover of the catalog notes that the company had been making tools for more than 25 years, providing us with a mid-1940s estimate for the founding date. This catalog was received with a separate price list No. U-173 dated January 15, 1973. The later catalog also provides the specific alloy steels used for the tools, with AISI 6150 chrome-vanadium steel used for the chisels, punches, and screwdrivers, and AISI 4140 chrome-molybdenum steel used for the wrenches. Fig. 240. Vanadium Tool C-6 3/8 Combination Wrench. Fig. 240 shows a Vanadium Tool C-6 3/8 combination wrench, marked "Vanadium Tool Co." on the shank. The overall length is 4.8 inches, and the finish is chrome plating. Fig. 241. 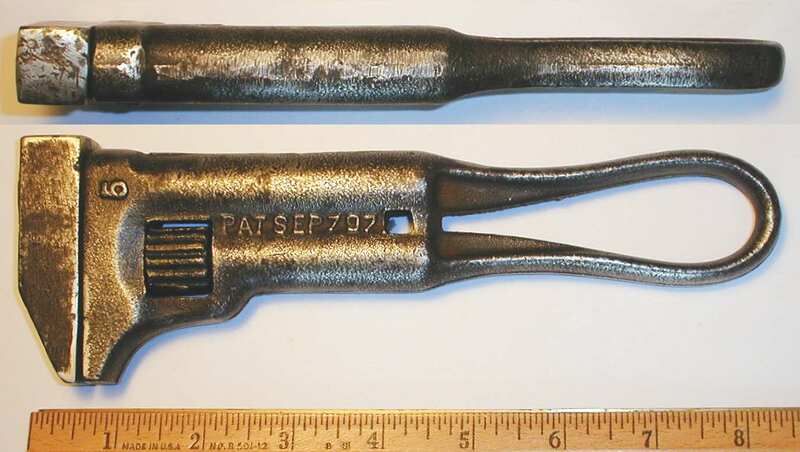 Vanadium Tool 7/8 Combination Wrench, with Inset for Side View. Fig. 241 shows a Vanadium Tool 7/8 combination wrench, marked "Vanadium Tool Co." on the shank. The overall length is 11.2 inches, and the finish is chrome plating. Fig. 242. 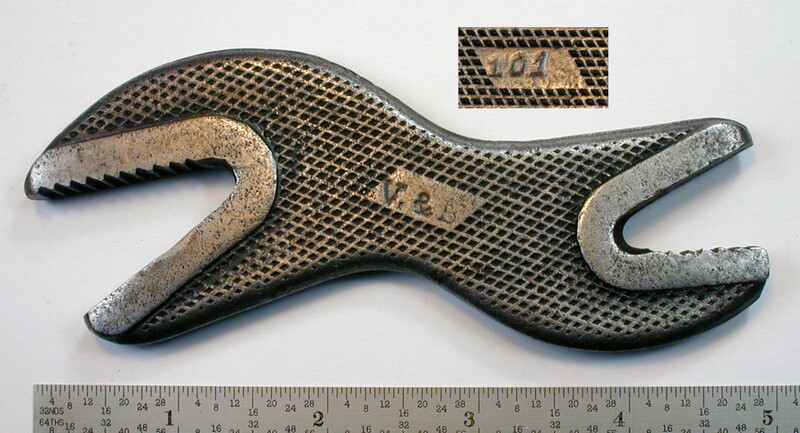 Vanadium Tool 15/16 Combination Wrench, with Inset for Side View. Fig. 242 shows a Vanadium Tool 15/16 combination wrench, marked "Vanadium Tool Co." on the shank. The overall length is 12.8 inches, and the finish is chrome plating. Fig. 243. Vanadium Tool CF-10 5/8 Offset Combination Wrench, with Inset for Side View. Fig. 243 shows a Vanadium Tool CF-10 offset combination wrench, marked "Vanadium Tool Co." on the shank. The overall length is 7.7 inches, and the finish is chrome plating. The Vandegrift Manufacturing Company was a maker of nut and pipe wrenches, founded by Theodore F. Vandegrift and operating in Shelbyville, Indiana. The company was active from around 1891 through at least 1905. Many (if not all) of the company's products were based on patents issued to Vandegrift. 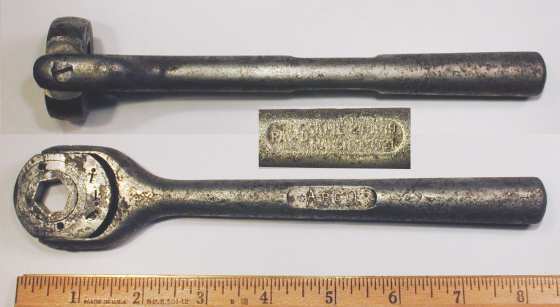 Some Vandegrift wrenches were made under contract for various farm machinery companies, and these tools may be marked with names such as International Harvester or McCormick. Fig. 244. Vandegrift No. 5 Monkey Wrench, with Inset for Side View, ca. 1897-1905. Fig. 244 shows a Vandegrift No. 5 monkey wrench, marked with a number "5" and the patent notice "Pat. Sep 7 97" cast in the handle. The patent notice corresponds to patent #589,765, issued to T.F. Vandegrift in 1897. Vaughan & Bushnell was founded in 1869 by Alexander Vaughan and initially operated as a maker of post augers in Chicago, Illinois. Vaughan had invented an improved auger and received patent #91,387 in 1869. The success of the auger business led to the production of other types of hand tools. After the Chicago fire of 1871 destroyed the business, Sidney Bushnell provided additional capital to rebuild the business, and in 1882 the company was incorporated as the Vaughan & Bushnell Manufacturing Company. By the 1880s the company was making a wide variety of tools, including hammers, chisels, punches, wrecking bars, and pliers. By 1920 the company was using vanadium steel for some of its tools, a significant early use of alloy steel. The advertisement at the left was published on page 88 of the November 1, 1920 issue of Southern Hardware and Implement Journal and illustrates a vanadium steel hammer, as well as a bit brace with vanadium steel jaws. By 1922 the Vaughan family had purchased a controlling interest in the company. The notice at the left, published on page 97 of the December, 1922 issue of Hardware World, notes the acquired controlling interest and the promotion of Alexander S. Vaughan, the founder's grandson, to the position of secretary and treasurer. The company continues in business today as Vaughan Manufacturing, and interested readers can find more information at the Vaughan [External Link] web site, which includes a page on the History of Vaughan & Bushnell [External Link]. Vaughan & Bushnell products were available from many industrial distributors, and the catalogs of these companies are a good source of information on V&B products. For example, the 1918 catalog "E" from the Ducommun Hardware Company of Los Angeles lists V&B alligator wrenches on page 237, and shows illustrations of Nos. 0, 1, 2, 3, 12, 13 and 14. Fig. 245. Vaughan & Bushnell 8 Inch Button's Pattern Pliers, with Insets for Side View and Detail. Fig. 245 shows a pair of Vaughan & Bushnell 8 inch Button's Pattern Pliers, stamped with "Vau???Bushn??" faintly visible on one handle (see middle right inset). Button's Pattern pliers were first produced by J.M King & Company in the late 1860s and became one of the most popular styles of wire-cutting pliers. The Vaughan & Bushnell Button's pliers shown here are very similar to the J.M. King models. Fig. 246. Vaughan & Bushnell Cotter Pin Puller, with Inset for Marking Detail. Fig. 246 shows a Vaughan & Bushnell cotter pin puller, stamped "Vaughan & Bushnell Mfg. Co." on the side. 1918 Catalog Listing for Vaughan & Bushnell Alligator Wrenches. Alligator wrenches were an important early product for V & B. The scan at the left, from page 237 of the 1918 Ducommun catalog "E", gives illustrations for six models of alligator wrenches, Nos. 0, 1, 2, 3, 12, 13, and 14. The table at the bottom of the listing gives specifications and prices for the wrenches. The description notes that the wrenches are drop-forged from "extra warranted steel" and then oil tempered. Fig. 247. Vaughan & Bushnell No. 101 Double-Ended Alligator Wrench, with Inset for Reverse Detail. Fig. 247 shows a Vaughan & Bushnell No. 101 double-ended alligator wrench, stamped with "V. & B." on a panel in the center of the checkered field, with the "101" model on the reverse panel. The overall length is 4.9 inches, and the finish is plain steel. The Vim Tools Company operated in Minneapolis, Minnesota beginning in the 1920s or earlier. The company produced a variety of general purpose and specialized automotive service tools. Fig. 248. Vim V-3 5/8x11/16 Tappet Wrench, with Inset for Reverse Detail. Fig. 248 shows a Vim V-3 5/8x11/16 tappet wrench, stamped "Vanadium Tappet" with the "VIM" name on the shank. The fractional sizes are stamped on the faces, with the model number on the reverse face. The overall length is 8.0 inches, and the finish is nickel plating. Fig. 249. Vim 11/16x3/4 Offset Box Wrench, with Inset for Side View. Fig. 249 shows a Vim 11/16x3/4 offset box wrench, marked only with the "VIM" name and fractional sizes. The overall length is 9.4 inches, and the finish is plain steel. Fig. 250. Vim 216 Wheel Weight Pliers, with Inset for Marking Detail. Fig. 250 shows a pair of Vim 216 wheel weight pliers, designed for installing and removing weights during tire balancing. The handle is stamped "Vim" with the model number. The overall length is 10.6 inches, and the finish is cadmium plating. The Vulcan Manufacturing Company operated in Winona, Minnesota and is currently known only by the wrench in the next figure. We hope to add more information for the company in the future. Fig. 251. Vulcan Manufacturing "Largrip" 10 Inch Adjustable Wrench, with Insets for Side View and Reverse Detail. Fig. 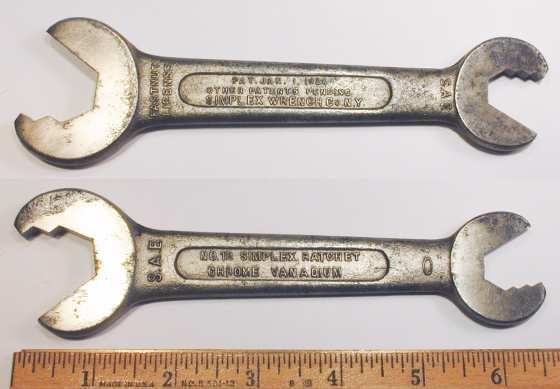 251 shows a Vulcan Manufacturing 10 inch adjustable wrench, marked with "Largrip" and "Pat Pend" forged into the shank, and with "Vulcan Mfg Co" and "Winona Minn" on the reverse. This wrench is unusual in having a rectangular keyed slot, instead of the more common round keyway. The Wakefield Wrench Company was an early maker of adjustable wrenches operating in Worcester, Massachusetts. The company began operations in the 1890s and took its name from the principal, J.E. Wakefield, an inventor of some note. In later years the company was run by Clarence E. Wakefield, the son of the founder. The advertisement at the left was published in the December 22, 1904 issue of Iron Age and shows a Wakefield nut and pipe wrench. Some Wakefield tools were marked with the "Wizard" brand, apparently an unregistered mark which could be confused with the later Wizard trademark registered by Western Auto Supply. Fig. 252. Wakefield No. 3 Quick-Adjusting Pipe Wrench, with Insets for Side View and Reverse Detail, ca. 1890s to Early 1900s. Fig. 252 shows a Wakefield No. 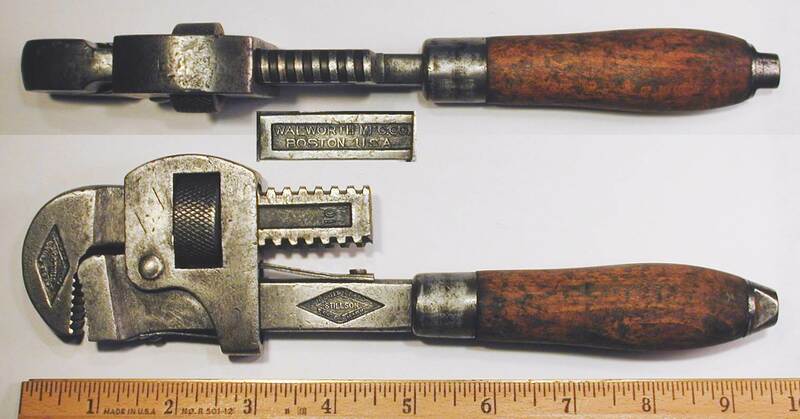 3 quick-adjusting pipe wrench, stamped with "The Wakefield Wrench" and "Worcester, Mass." on the upper jaw, and with the "No. 3" model number on the lower handle. The reverse jaw is stamped with "Pat. June 30, 91" and "Other Pat's Pending" patent notices, as shown in the lower inset. The overall length is 16.0 inches fully extended, and the maximum opening is 2.3 inches. The finish is plain steel. The patent date refers to patent #454,893, filed by J.E. Wakefield in 1890 and issued in 1891. Fig. 253. Wakefield 5 Inch Bicycle Wrench. Fig. 253 shows a Wakefield 5 inch bicycle wrench, stamped "Wakefield Wrench" and "Made in Worcester, Mass. U.S.A." on the shank. The overall length is 5.4 inches. The finish is plain steel with pitting due to rust, but the original finish may have been nickel plating. Fig. 254. Wakefield No. 8 8 Inch Bicycle Wrench, with Inset for Reverse Detail, ca. 1900. Fig. 254 shows a very early Wakefield No. 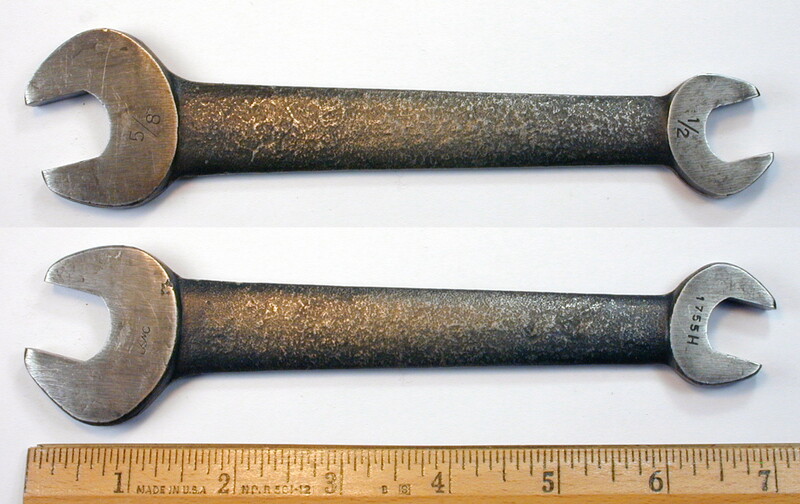 8 bicycle wrench, marked "Wakefield Wrench" and "Made in Worcester, Mass. U.S.A.", with "Pat. Sept. 4, 1900" on the reverse (see inset). The overall length (fully extended) is 8.0 inches. The date marked on the tool refers to patent #657,326, which was issued to J.E. Wakefield. The patent describes the construction of the wrench, and the most notable feature is the handle tube drawn from a single sheet of steel. Fig. 255. Wakefield 10 Inch Nut & Pipe Wrench, ca. 1908-1920. Fig. 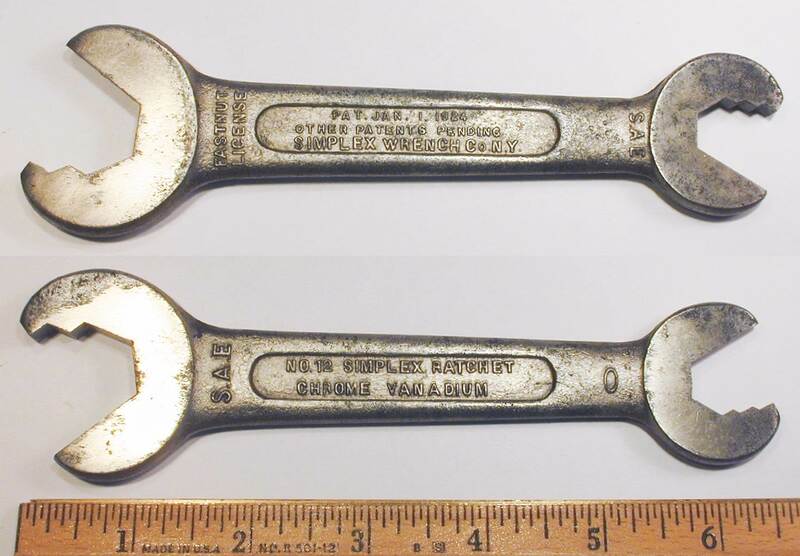 255 shows a Wakefield 10 inch "Nut & Pipe" adjustable wrench, marked "Wakefield Wrench" and "Worcester, Mass. U.S.A." with a "Pat. May 5, 1908" patent notice. Fig. 256. Wakefield No. 24 1/2-Hex Drive Ratchet, with Inset for Reverse Detail. Fig. 256 shows a Wakefield No. 24 1/2-hex drive ratchet handle, marked "Made in Worcester, Mass. U.S.A." with "Pat. Jul 12 1910" and "Pats. Pending" on the reverse. The overall length is 7.0 inches. A patent search found this tool described by patent #963,895, issued to H.L. Houghton on the cited date. The patent corresponding to the pending status has not yet been found. Fig. 257. Wakefield No. 19 9 Inch Monkey Wrench, ca. 1922-1930. Fig. 257 shows a somewhat uncommon Wakefield No. 19 monkey or auto wrench, marked "Made in Worcester, Mass. U.S.A." and "Pat'd. Nov. 14 1922". The overall length is 9.1 inches. The cited patent date refers to patent #1,435,548, issued to J.F. Oliver and J.P. Fleming, and assigned to Clarence E. Wakefield. Fig. 258. Wakefield No. 45 1/2x9/16 Open-End Wrench. Fig. 258 shows a Wakefield No. 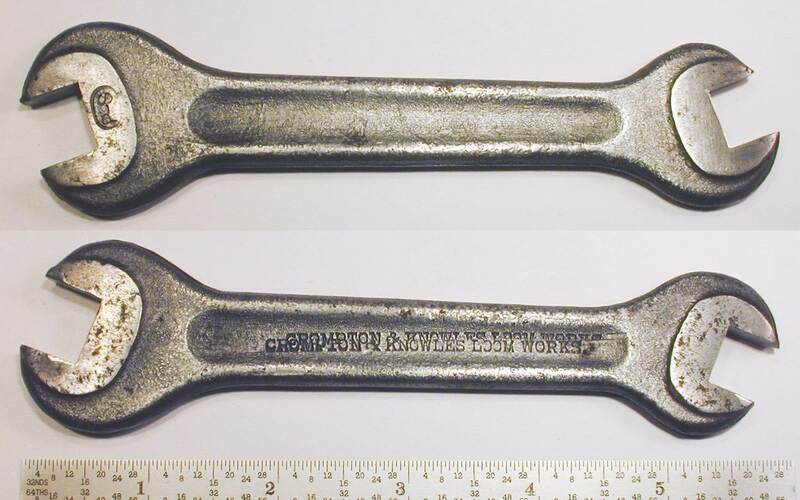 45 1/2x9/16 open-end wrench of stamped steel construction, marked with "Wakefield" and "Made in Worcester, Mass. U.S.A." stamped on the shank. Fig. 259. Wakefield No. 55 1/2x9/16 Open-End Wrench. Fig. 259 shows a Wakefield No. 55 1/2x9/16 open-end wrench of stamped steel construction, marked with "Wakefield" and "Made in Worcester, Mass. U.S.A." stamped on the shank. The overall length is 5.8 inches. Fig. 260. Wakefield No. 70 3/4x25/32 Open-End Wrench. Fig. 260 shows a Wakefield No. 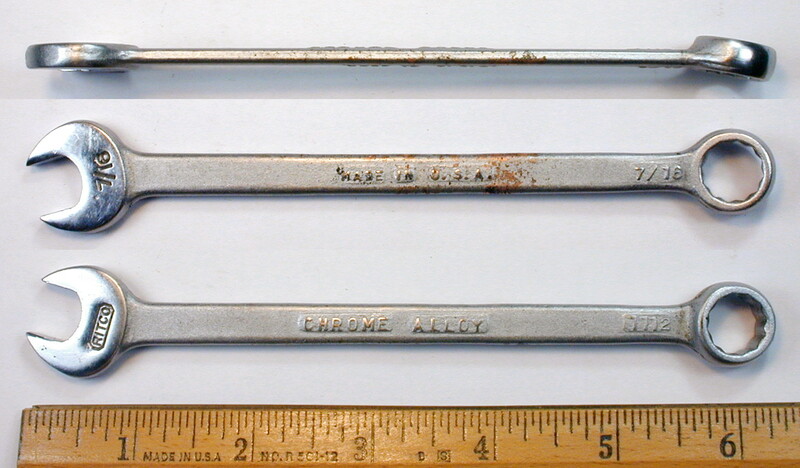 70 3/4x25/32 open-end wrench, marked with "Wakefield" and "Made in Worcester, Mass. U.S.A." stamped on the shank. The overall length is 7.8 inches. Wakefield sometimes used the "Wizard" brand for its products, as the next figure illustrates. Fig. 261. Wakefield "Wizard" No. 34 1/2x9/16 Nut-and-Tap Open-End Wrench. Fig. 261 shows a Wakefield "Wizard" No. 34 open-end wrench in the nut-and-tap style, stamped "Made in Worcester, Mass, U.S.A." on the shank. The overall length is 4.8 inches, and the finish is plain steel. The square opening in the center allowed the wrench to be used as a (threading) tap handle, and this style was commonly called a "Nut and Tap" wrench. The center hole was also typically used with a bolt for holding sets of wrenches. An example of Nut-and-Tap wrenches from another maker can be seen as the Indestro Nut-and-Tap Wrench Set. Wakefield's use of the "Wizard" brand should not be confused with later (and better known) use by the Western Auto Supply Company. The Walworth Manufacturing Company was a maker of pipe wrenches and other plumbing tools operating in Boston, Massachusetts. The company was founded in 1852 as J.J. Walworth & Company and later incorporated as Walworth Manufacturing in 1872. The founder was James J. Walworth, who served as company president until 1890. Walworth Manufacturing is most famous as the original maker of the Stillson pipe wrench, named after its inventor Daniel Stillson, who was an employee of the company at the time. The original Stillson design was covered by patent #95,744, filed by Daniel Stillson in 1869 and issued later that year. Fig. 262. Walworth 10 Inch Stillson Pipe Wrench, with Insets for Side View and Reverse Detail. Fig. 262 shows a Walworth 10 inch Stillson pipe wrench, marked with "Stillson" and "Registered Trade Mark" in a diamond logo forged into the shank, with "Walworth Mfg. Co." and "Boston, U,.S.A." forged into the reverse. The overall length is 9.4 inches closed and 10.8 inches fully extended. The finish is plain steel. The Waymoth Corporation of Pawtucket, Rhode Island is known only as a maker of cutting pliers, as shown in the next figure. Fig. 263. Waymoth No. 2 6 Inch Diagonal Cutters, with Inset for Side View. Fig. 263 shows a pair of Waymoth No. 2 6 inch diagonal cutters, marked "The Waymoth Corp." and "Pawt. R.I." around the pivot. Whitman & Barnes (W&B) was a well-known tool maker active in the late 19th and early 20th centuries. The company was founded in 1877 by the merger of the Whitman & Miles Company with George Barnes & Company, and initially operated as a maker of knives. The company acquired the Acme line of monkey wrenches from the Capital Manufacturing Company in 1893. In subsequent years the company expanded its wrench business with various models of bicycle wrenches, pipe wrenches, fixed and adjustable alligator wrenches, auto wrenches, and other tools. One of their best known products was the line of "Bull Dog" alligator wrenches, produced in a range of sizes. Twist drills were another important product of W&B. The illustration at the left shows an advertisement for twist drills published in the December 2, 1909 issue of The Iron Age. In 1920 the J.H. Williams company acquired the drop-forge and wrench operations of Whitman & Barnes, and the W&B president A.D. Armitage became a vice-president of J.H. Williams. Some of the W&B product lines (e.g. monkey wrenches and alligator wrenches) remained in production under J.H. Williams. Fig. 264. W&B No. 1 Alligator Wrench, with Inset for Reverse Detail. Fig. 264 shows a W&B No. 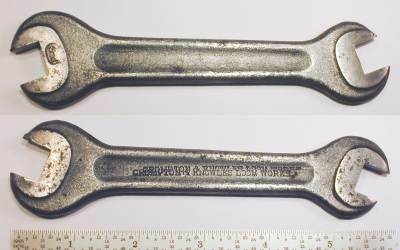 1 alligator wrench, stamped with the W+B-Diamond logo and "Made in U.S.A." on one side, with the model number on the reverse. The overall length is 5.5 inches, and the finish is plain steel, with pitting due to rust. Fig. 265. W&B 5 Inch Alligator Wrench. Fig. 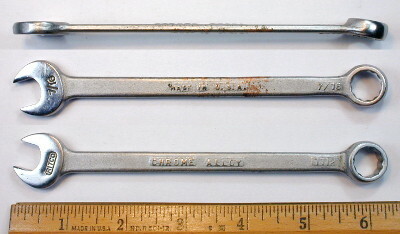 265 shows a W&B 5 inch double-ended alligator wrench, stamped with the WBCo-Diamond logo, with "Made in U.S.A." in the center. The overall length is 4.9 inches, and the finish is nickel plating. Fig. 266. W&B 5.5 Inch Bicycle Wrench, with Inset for Marking Detail. Fig. 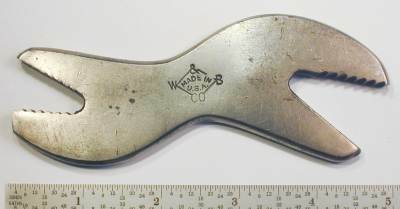 266 shows a W&B 5.5 inch bicycle wrench, stamped with the WBCo-Diamond logo, with "Made in U.S.A." below. The overall length is 5.6 inches, and the finish is nickel plating. The prominent grooves in the shank give the wrench a distinctive appearance, but the intent appears to be cosmetic rather than functional. Fig. 267. W&B No. 27 19/32x11/16 Open-End Wrench, with Insets for Reverse Detail. Fig. 267 shows a W&B No. 27 19/32x11/16 open-end wrench, marked with "Made in U.S.A." and the W+B-Diamond logo forged into the shank. The overall length is 5.9 inches, and the finish is plain steel. The insets show the reverse face markings "3/8" and "5/16", references to the older U.S.S. size convention. Fig. 268. W&B No. 501 1/2x5/8 S-Shaped Open-End Wrench, with Inset for Reverse. Fig. 268 shows a W&B No. 501 1/2x5/8 S-shaped open-end wrench, marked with the model number and "Made in U.S.A." plus the W+B-Diamond logo forged into the shank, with the fractional sizes forged into the reverse. Fig. 269. W&B No. 287 19/32 Single-Open Toolpost Wrench, with Insets for Side View and Reverse Detail. Fig. 269 shows a W&B No. 287 19/32 single-open toolpost wrench, marked with the W+B-Diamond logo forged into the head, with the model number forged into the reverse. Fig. 270. W&B No. 478 1/2 Open-End Spud Wrench, with Inset for Side View. Fig. 270 shows a W&B No. 478 1/2 single open-end wrench with a spud handle, marked "Made in U.S.A." with the W+B-Diamond logo forged into the shank. The T. Williams Company is a British maker of wrenches and other forged tools, most frequently found as the "Superslim" brand. Currently we don't have any additional information on the company, but hope to expand this section in the future. Tools made by T. Williams are generally marked with a forged-in logo showing a "T/W" in a circle. Fig. 271. Superslim 1/2x9/16 Open-End Wrench, with Inset for Reverse Detail. Fig. 271 shows a Superslim 1/2x9/16 open-end wrench, marked with the fractional sizes and "AF" forged into the shank, with "Made in England" and the T/W logo forged into the reverse. The overall length is 6.2 inches, and the finish is cadmium plating. Fig. 272. Superslim 5/8x3/4 Open-End Wrench, with Inset for Reverse Detail. Fig. 272 at the left shows a Superslim 5/8x3/4 open-end wrench, marked with the fractional sizes and "AF" forged into the shank, with "Made in England" and the T/W logo forged into the reverse. The overall length is 7.7 inches, and the finish is cadmium plating. The Winner Tool Company operated in Puyallup, Washington as the maker of a patented plier-wrench. Fig. 273. Winner Tool 8 Inch Plier-Wrench, with Inset for Reverse Detail, ca. 1920s. Fig. 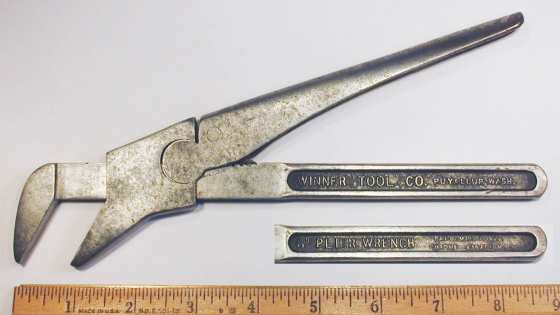 273 shows a Winner Tool 8 inch plier-wrench, marked with "Winner Tool Co." and "Puyallup, Wash." forged into the shank, with "Plier Wrench" plus "Patd. Mar. 7, 1922" and "Chrome Vanadium" forged into the reverse. The overall length is 9.3 inches, and the finish is plain steel. The patent date refers to patent #1,408,524, filed by W.T. Long in 1921 and issued in 1922, with assignment to the Usona Manufacturing Company. The Wright Wrench Manufacturing Company was founded in Canton, Ohio as a maker of quick-adjusting nut wrenches. The company probably began operations around 1909, and the founder is presumed to have been James F. Wright, an inventor whose patents formed part of the basis for the company's products. The illustration at the left, published in the 1909 Volume 24 of The Horseless Age, shows the construction of the Wright quick-adjusting wrench, and a brief note in the text describes the operation and advantages of the wrench. In 1909 the company began operating an additional facility in Tacoma, Washington, and later wrench production was typically marked with either the Canton or Tacoma location. In 1910 the company name was changed to the Wright Wrench & Forging Company, and the company introduced a line of quick-adjusting pipe wrenches, based on a later patent by James F. Wright. Fig. 274. Wright Wrench 8 Inch Quick-Adjusting Nut Wrench, with Insets for Side View and Reverse Detail. Fig. 274 shows a Wright Wrench 8 inch quick-adjusting nut wrench, marked with "Steel Forging" and "Pat 3-04 - 1-09" forged into the shank, with "Wright Wrench Co." and "Made in U.S.A." forged into the reverse. The patent notice is a bit tricky to interpret, as it provides the month and year for two separate patent dates. The first date refers to patent #754,633, filed by L. Ash and H.B. Stewart in 1903 and issued on March 15, 1904. The second date refers to patent #910,890, filed by J.F. Wright in 1907 and issued on January 26, 1909. Zim Manufacturing is a maker of automotive specialty tools based in Chicago, Illinois. The company began operations in the 1920s (or earlier) and is probably best known for their automotive valve service tools. Fig. 275. Zim Valve Adjusting Tool, with Inset for Side View, ca. 1930s. Fig. 275 at the left shows a Zim valve adjusting tool, consisting of a 9/16x5/8 stamped-steel box wrench fitted with a retractable screwdriver. The tool is stamped "Zim Mfg. Co. Chicago" and "Made in U.S.A." on the arm. The overall length is 8.1 inches, and the finish is cadmium plating. In operation, the swinging arm is positioned over the desired wrench opening and then secured with the thumbscrew. The wrench then loosens the valve lock nut while the tappet is adjusted with the screwdriver, and the nut is tightened when the correct setting is reached. This tool is virtually identical to the New Britain Valve Adjusting Tool shown in our article on the New Britain Machine company.